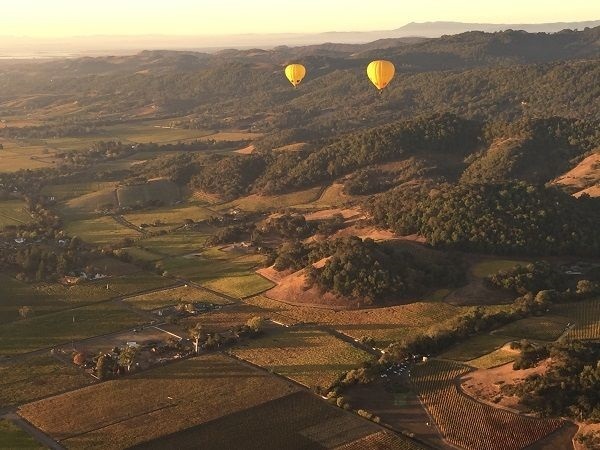 Napa Valley, the Big Daddy of California wines, is today world-famous for Big Cabs and Bold Chardonnays, landmark wineries and the Napa Valley Wine Train. But dig a little deeper, and you find a lot more than those stereotypes. First, it wasn’t always thus: Cabernet Sauvignons of the 1970s were far from the 15% ABV, super-oaked blockbusters that became the norm in the 1990s. Moreover, perhaps partly as a result of the In Pursuit of Balance movement and partly as more wineries explore mountain vineyards over the Valley floor, there are some wineries bringing restraint and freshness back to Napa’s flagship – Cathy Corison perhaps the most celebrated. Likewise, whilst turbocharged Chardonnays do absolutely still exist, like Shafer’s Red Shoulder Ranch Chardonay at almost 15% ABV with full barrel maturation and MLF butteriness (actually a good wine, I must add), others are again dialling-back a little. Furthermore, the Valley does have other options. A fellow MW pointed out that Argentina should be worried by its Malbec, and I certainly tasted a couple of interest. Merlot may be having a renaissance as well, with Duckhorn’s 2015 Three Palms Vineyard Merlot being made Wine Spectator’s Wine of the Year. Myriad other varieties are being tested too. It should be said that rich, ripe and fully-oaked Cabernets not only exist, but can be done well by the right producers. I had a rule-of-thumb that Cabernet Sauvignon over 15% ABV lost its identity and fell apart, but I have now found some that held quality, even at that level of ripeness. At 14.8%, Screaming Eagle Cabernet Sauvignon 2016 is nearly in that camp, yet it gives a masterclass in elegance, integration, perfume and above-all, freshness. The downside of Napa’s fame is that everything comes at a price, and an oft-inflated one at that. Where wines of equivalent quality in Sonoma or Santa Barbara might be $40, $60 or $80 a bottle, their Napa counterparts are $100-200. The old ‘$100 / bottle Napa Cabernet’ norm now seems to be more like $300, while ‘cult’ wines can easily exceed $500. That makes great Napa wines far less accessible to most people, and especially in export markets, which is a real shame because much of Napa’s reputation is entirely justified. Napa Valley starts at San Pablo Bay, with the Napa section of Carneros. 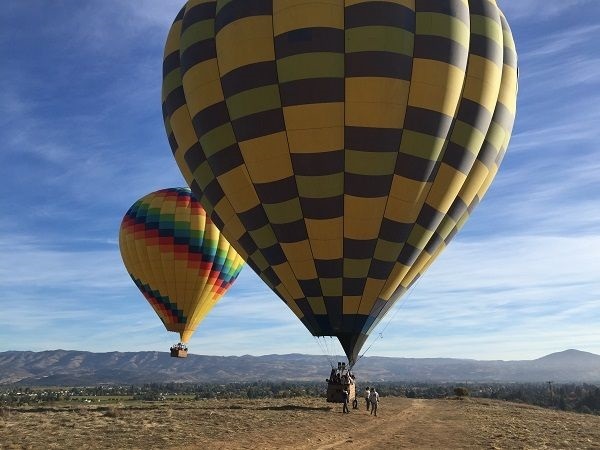 It runs roughly North-west and gradually tapers, moving inland, as the Eastern Vaca Range of mountains closes in towards the Western Mayacamas Range that divides Napa from Sonoma that lies further West. The two ranges almost meet at the top of the Valley, just beyond the town of Calistoga. To the North of that small gap lies Sonoma’s Knights and Alexander Valleys. 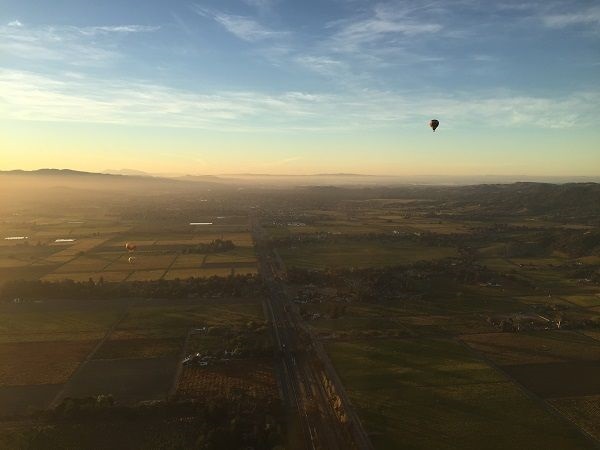 The degree to which Bay fogs penetrate up the Valley transforms the Southern end into a cool-climate zone, while the Calistoga end is much warmer, yielding sparkling grape-growing in Carneros and very ripe Cabernet around Calistoga. At least in terms of the Valley floor. In the mountain zones, of increasing interest to winemakers, altitude can lift vineyards above the fog line to give greater solar exposure – even if the altitude itself moderates temperatures. Though comparatively simple topographically, Napa is incredibly complex geologically. Time as a seabed provides marine elements of shale, limestone and sandstone. Volcanic venting generated significant amounts of tuff derived from volcanic ash, and other volcanic components. After folding and other processes to create the Mayacamas and Vaca ranges, erosion then stripped much of the Mayacamas volcanic material and deposited it and other gravels and loams in the form of alluvial fans onto the Valley floor too – creating the renowned benchlands, including the Rutherford and Oakville benches in the heart of the Valley. Although much of the 45,400 acres of vineyard planting is on the flat Valley floor, where aspect is not really a factor, with more exploration of hillside and mountain vineyards – as long as they do not exceed 30% in steepness, above which it is illegal to plant – there is also a fair range of different exposures to play with as well. This complexity does give winemakers who are looking for freshness or looking to express different terroirs, something of a diverse palette to explore. This looks like something of a trend within Napa, with what seems to me to be more single-vineyard labelling or at least bottling a range of AVAs. Carneros (Napa): by San Pablo Bay and, like the Sonoma side, this is the lowest-lying and most exposed to cooling Bay-fogs. Chardonnay and Pinot Noir, for sparkling wines as well as still, dominate, though the likes of Hyde Vineyards grow Merlot that can have some cool-climate restraint too. Sparkling producers include Mumm’s and Taittinger’s respective California outposts, Mumm Napa and Domaine Carneros. Stag’s Leap District: overlooked by the Stag’s Leap rocky crag itself, this is an unusual alluvial fan from the Vaca range, below Atlas Peak. I find the wines from this region, including both the eponymous wineries, Stag’s Leap Winery and Stag’s Leap Wine Cellars, to have dimensions of freshness, elegance and often a dusty-rocky mineral tone. Oakville: Oakville’s alluvial benchlands may not be quite as famous as Rutherford’s, but it is home to Napa’s most famous vineyards: To Kalon and its next-door neighbour, Martha’s Vineyard. To Kalon Cabernet Sauvignon fruit from the section farmed by Andy Beckstoffer can go for anything up to $50,000 / ton and single-vineyard bottlings are rarely less than $300 a bottle. Oakville is home to a plethora of great producers, including Robert Mondavi, Opus One, Silver Oak, Rudd and Screaming Eagle. Rutherford: the Rutherford Bench on a Mayacamas alluvial fan, is the most famous of the Napa benchlands. Its well-drained, gravelly soils providing conditions not that bear some relationship to the gravel ‘croupes’ of the Médoc. Its Cabernet Sauvignon fetches high prices per ton and it is home to several historic Napa champions, including the resurgent Inglenook and the sadly somewhat jaded Beaulieu Vineyards, whose Georges de Latour used to be a beacon for fine Cabernet Sauvignon in the Valley. Mt Veeder: the largest Mayacamas mountain AVA, and most Southerly, sitting above Oakville and Yountville. Scattered vineyards along the ridge-line get the coolest and wettest conditions in the Valley, meaning ripening can be a challenge, but freshness is generally good. Cabernets can be a little rustic here. Diamond Mountain: only 202Ha planted, but 81% to Cabernet. 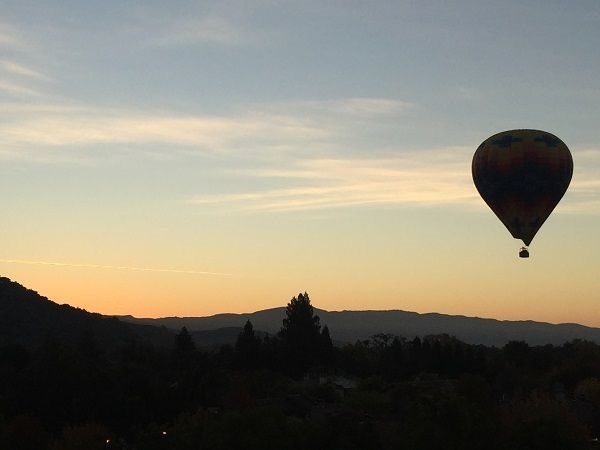 Though this sits above Calistoga in the hottest end of Napa, at the North end of the Mayacamas, it is notably cooled by air passing through Diamond Creek. Also, unusually for the Mayacamas, soils are volcanic, including volcanic glass that lends its name to the mountain. Though small, the two examples shown from Lokoya and Dyer were particularly fine and fresh. Howell Mountain: at the Northern end of the Vaca, on red volcanic soils, the AVA’s boundaries – like Fort Ross-Seaview in Sonoma – are defined by the fogline. Cabernet dominates here but there’s some historic Zinfandel too apparently. Wines tend to favour power over elegance. Atlas Peak: at the South-eastern section of the Vaca range, with more rainfall than other parts of the Vaca, and overlooking Stag’s Leap District. Mountain vineyards on volcanic soils, that include the famous Stagecoach Vineyard, with Western exposures that warm up quickly. Only first planted in 1981, showing some impressive wines that balance ripeness and freshness, such as Au Sommet. 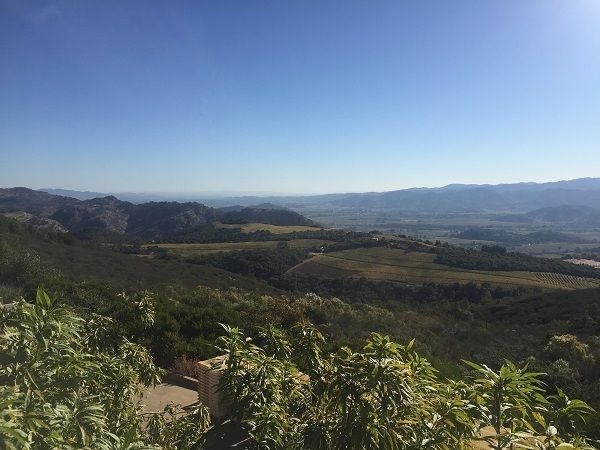 Pritchard Hill: strictly not an AVA, but has a cluster of wineries around the Chappelet’s original location, including Colgin and OVID, that have raised the profile of this area as a trendy source of sophisticated Cabernet Sauvignon. Along the ridge from Atlas Peak, its poor, rocky soils naturally restrain yields, being above the fog line gives solar exposure for ripeness, while altitude helps preserve acidity. Peter Marks MW (Robert Mondavi), Matt Deller MW (TOR Wines COO, who focus on single-vineyard expressions) and Nova Cadamatre MW (Robert Mondavi Director of Winemaking) presented Napa wines from each decade between the 1970s and 2010s, to explore the evolution of styles and wines across the period where Napa established itself as the pre-eminent region in the US. Linda Reiff of Napa Valley Vintners also gave an introduction, reminding us that Napa makes 4% of California and 0.4% of global wine production. Soils are diverse, with around half of the world’s soil orders in one valley. 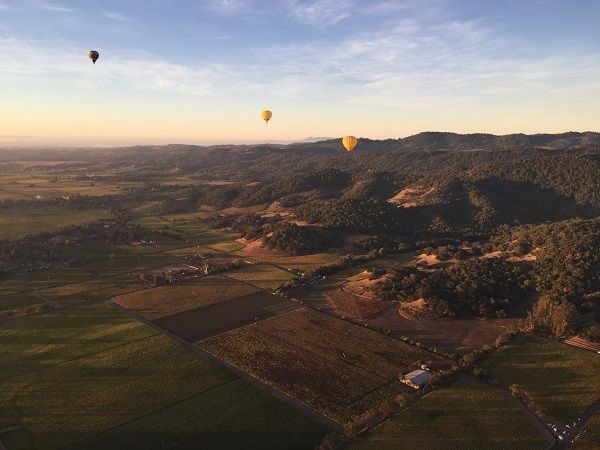 90% of Napa County is under permanent or high levels of development protection, reflecting deep environmental commitment, and aim for 100% sustainability certification of Napa Valley Vintners members by 2020. Peter looked at the pre-1970s and 1970s history. The 1968 Agricultural Preserve constrained development and focused the region on agriculture. In 1967 dry wines overtook sweet wines as the largest volume sales. Robert Mondavi built in 1966 – the first, new commercial winery in the valley since Prohibition. 1973 saw grapes exceed cattle as the largest agricultural product. California sprawl pruning shaded grapes with leaves, coupled with leafroll virus resulted in irregular ripening and tart aspects to wines. Cabernet was still relatively sparsely planted and cost $473 / ton (v. $7,500 average today). The 1976 Judgement of Paris brought external focus and investment. Opus One was founded in 1979, in JV with the Rothschilds. Pioneers of Cabernet included Joe Heitz and the Diamond Creek Winery. In the 1980s, technology came in, with deeper research into understanding how wines work and how they are made. UC Davis did more vineyard and winery research. The Wine Advocate and Wine Spectator scoring wines came to the fore and Napa began to transition to a more modern style. Drip irrigation was introduced in 1975 by Andy Beckstoffer and widely adopted in the 1980s without understanding – often leading to over-irrigation. Phylloxera arrived at the end of the 1980s as the Valley was planted to non-resistant AxR1 alongside resistant St George rootstocks. All AxR1 has now been re-planted. Mountain viticulture also came to the fore in the decade. Groth Cabernet was the first US wine to be awarded 100 points by Robert Parker, which drew sales and opened eyes to how his influence could bring sales for wines he liked. Wineries used to penalise growers for grapes that went over 24 Brix, which then changed as ripeness was seen to matter, and Brix levels rose. Winemakers had more influence and control on picking date. The 1990s were a decade of investment in a buoyant economy, as consumers were willing to spend on wine, whilst entrepreneurs had money to invest in the Valley. Consumers were also into plushness and sweetness, almost as a reaction to 1980s austerity, and Robert Parker’s critical acclaim for those styles brought it to the attention of producers. Cabernet prices rose rapidly in the 1990s, with cult producers releasing at $40 in the early 1990s, then $150 and higher by the end of the decade. Much re-planting happened following AxR1 in the 1990s, with many producers inspired by Bordeaux into close-planting. Simultaneously, virus-free clones on better rootstocks with VSP were used, leading to rapid growth in fruit ripeness that fitted consumer and critical demand. 1997 then happened – a high-yield year that led to late picking as a result of labour shortages – that was then highly lauded, leading to over-indulgence in ‘hang time’. Napa Valley ‘cult’ winemakers emerged in this decade as small-producing winemakers were able to sell direct, as inter-state shipping became deregulated, so Screaming Eagle, Harlan, Colgin and Araujo all were established. Oak use accelerated, not so much on the proportion of new oak, but on higher toast levels for marked flavour, and longer 20-24 month ageing. In the 2000s, night-time average temperatures had risen from 50-53°F since 1970, accelerating malic acid decomposition, increasing softness at the same time as starting photosynthesis earlier in the day, resulting in more sugar accumulation, while daytime temperatures didn’t shift too much. Going to the high-powered blockbuster style accelerated. Some producers like Cathy Corison were looking away from the now-dominant blockbuster style, however, looking for freshness. Also, young winemakers at large wineries started side-projects, buying grapes for small production cuvées. That process accelerated as global downturns reduced money to spend on cult classics and the 2011, cooler vintage reinforced that Napa could make lighter, fresher, but fine Cabernets. In Pursuit of Balance and sommelier influence has helped drive that. To Kalon is 6-700 acres, with 450 acres owned by Mondavi, 100 acres by Opus One, 90 acres by Andy Beckstoffer, with 2-3 others covering the rest, including UC Davis with a small, experimental plot. 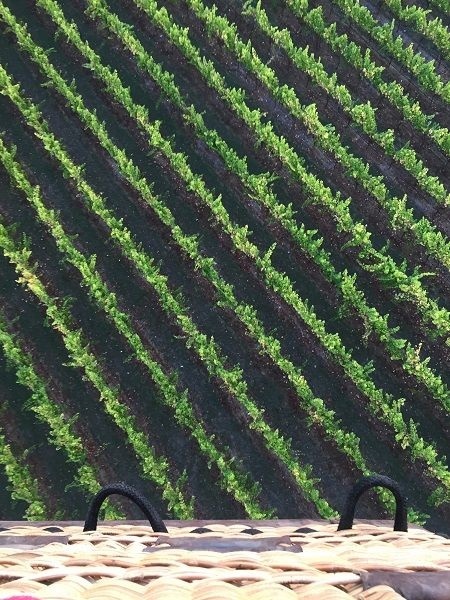 Mondavi are using micro-farming techniques to understand sub-block ripening above and below the soil surface. The first time Mondavi Reserve was To Kalon labelled was the cool 2011, where the quality of the vineyard showed through to the winemaking team. 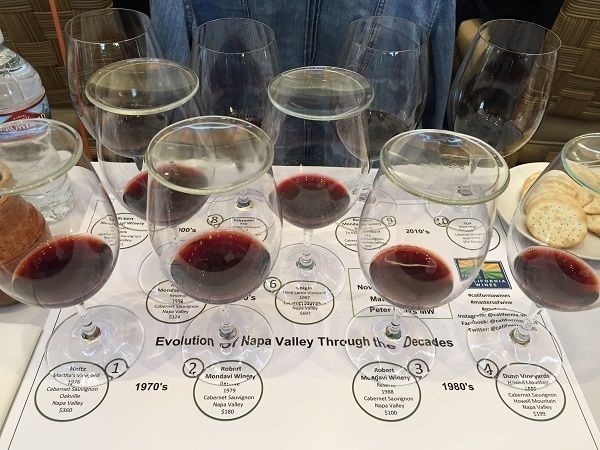 As for the wines, what was clear to me was 2 steps – more evident oak between the 1970s and 1980s, then much more ripeness and concentration by the 1990s – along with a major step-up in the release prices too (though I’m sure $30 would have been considered expensive in 1978!). The 1970s wines were both showing very well, with evident staying power, regardless of how much know-how there was at the time. It was a very great pleasure to drink the Heitz Martha’s Vineyard 1976 that I rated 18.5 / 20 or 97 / 100; the Robert Mondavi Reserve 1979 was just a nose behind. The 2000-10s wines sometimes veered into overripeness and power. In this ‘big’ idiom, however, both the Colgin Herb Lamb Vineyard 2007 and the Robert Mondavi Reserve 2013, from the best plots of To Kalon, were very fine examples. The $697 / bottle current market average for the Colgin is nevertheless, hard to justify, let alone the $150-170 original release price. Martha’s Vineyard fruit on benchland in Oakville AVA, with well-drained, rocky soils from the Mayacamas. Very dry year. Very low yields. 1 year in oak tank, 3 years in French oak then 1 year in bottle, pre-release. 5.71 g/L TA, pH 3.72, 13.5% ABV. $30 ($360) / bottle RRP. 88% Cabernet Sauvignon, 6% Cabernet Franc, 6% Merlot. 59% To Kalon, 41% other Napa vineyard fruit. Horizontal roto-tank fermentation for 4-5 days then 10 day maceration. 24 months in 87% new, Nevers French oak. 6.2 g/L TA, pH 3.41, 13% ABV. $35 ($180) / bottle RRP. 83% Cabernet Sauvignon, 14% Cabernet Franc, 3% Merlot. 60% To Kalon, 40% other Napa vineyard fruit. Extended post-ferment maceration. 18 months in small French oak with regular racking. 5.7 g/L TA, pH 3.57, 12.8% ABV. $45 ($100) / bottle RRP. 13-20 year old Dunn and Frank clones on St. George, planted on iron-rich clay slopes at 2,200 feet. Crushed and destemmed. Stainless steel fermentation, then 30-32 months in 50% new French oak. pH 3.67, 13% ABV. $30 ($199) / bottle RRP. 85% Cabernet Sauvignon, 10% Cabernet Franc, 2% Merlot, 2% Petit Verdot, 1% Malbec. 68% To Kalon, 82% of which in Oakville, 11% Stag’s Leap and 7% Carneros vineyards fruit. 40 day extended maceration. Pressed to 80% new, 60 gallon French oak for MLF then 17 months ageing with 6 rackings. Unfiltered. 0.7 g/L RS, 6.1 g/L TA, pH 3.67, 14% ABV. $125 / bottle RRP. Established by Andy Colgin and Fred Schrader. Lower Howell Mountain slopes at 6-800ft on weathered greenstone, surrounded by pine forest. Long growing season. 13.7% ABV. $697 ($150-170) / bottle RRP. 95% Cabernet Sauvignon, 5% Cabernet Franc. 91% To Kalon, 9% other Oakville Bench fruit. Hand-sorted, gravity-fed to 5,000 gallon French oak tanks for fermentation with 37 day extended maceration. Basket-pressed. 18 months in French oak barrels. 0.54 g/L RS, 6.3 g/L TA, pH 3.69, 15.5% ABV. $135 ($121) / bottle RRP. Schrader liked To Kalon fruit so much that he decided to make single-vineyard bottlings – in fact making 6 from the vineyard, often with specific clones. This had 100% clone 337, Block B1 and B2 Cabernet Sauvignon in Beckstoffer To Kalon, with high mineral soil content and good drainage, with North-South Sun exposure. 20 months in Darnajou French oak barrels. ? ?% ABV. $300 ($348) / bottle RRP. Heat spikes in July, but more stable August and September. 88% Cabernet Sauvignon, 8% Cabernet Franc, 4% Petit Verdot. To Kalon best plots. Hand harvested, sorted 3 times, destemmed to 5,000 gallon French oak vats for cold soak, fermentation and extended 34 day maceration. Pressed to 100% new French oak for MLF, then 21 months’ ageing. 6.4 g/L RS, 6.9 g/L TA, pH 3.73, 15% ABV. $155 ($140) / bottle RRP. Vine Hill Ranch that produced 1968 Georges de Latour. 2t Cabernet Sauvignon and 1t Petite Sirah, co-fermented in the same 3t vat. 3 weeks on skins, then aged in almost all new Darnajou barrels and 2 small French Taransaud oak barrels. ? ?% ABV. $300 / bottle RRP. After the formal Napa Cabernet masterclass, we had a more casual opportunity to taste a range of wines from Napa Valley Vintners, in the moonlit courtyard of the To Kalon winery with food vans to choose from. 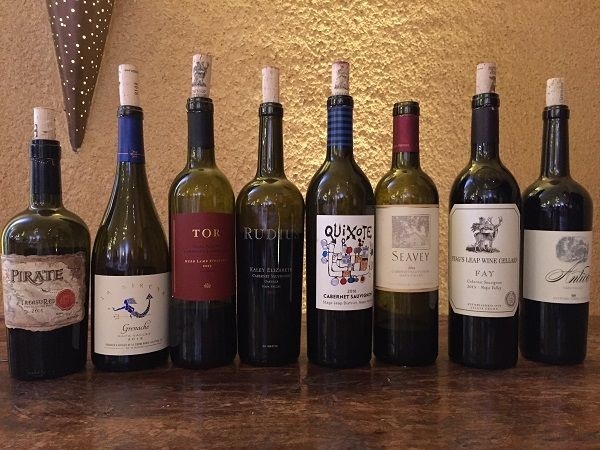 This relaxed tasting was designed to showcase more unusual varieties and styles from Napa, though there were a few more traditional Napa Cabernets. Some of the vintners were around too. With over 100 wines to choose from, I was never going to get around them all, and rather just tasted a more selective selection. By accident, these were mostly other Bordeaux varieties, with the odd alternative thrown in, as I sat down at a bench and some winemakers like James Stewart gradually sat down around me and they happened to have Bordeaux variety wines in the main. With the other Bordeaux varieties, Delia Viader brought a fabulous 2003 vintage of Viader “V” Petit Verdot, which is maturing beautifully. Alongside Pine Ridge’s pretty decent 2015 Petit Verdot, that suggests Napa can get the variety ripe enough to do varietal expressions. The couple of Cabernet Francs tasted, however, tended towards the overripe and oaky, so losing some of the perfume and elegance of the variety. Spoto Family’s 2015 Oakville Malbec, was authentic and dense, and suggesting Napa is able to give the Argentines a run for their money – though quite a lot of it, at $150 a bottle. Modus Operandi made their 2015 Antithesis Merlot in an unusual way, co-fermenting with the skins from a previous Petite Sirah ferment, to make a big, 15.5% ABV wine that nevertheless worked in its intriguing idiom. $150 again though. Basketball legend Yao Ming’s new Napa venture. ? ?% ABV. $?? / bottle RRP. Hillside vineyard overlooking San Pablo Bay. 2 months in stainless steel. 7.1 g/L TA, pH 3.27, 13.5% ABV. $?? / bottle RRP. 13.5% ABV. $27 / bottle RRP. Made by Paul Hobbs. 14.5% ABV. $175 / bottle RRP. 15.3% ABV. $110 / bottle RRP. 14.2% ABV. $90 / bottle RRP. 337 clone, planted on small-pebble soils, with East-West row-orientation for even ripening, near St Helena, that gets shaded by hills after 2pm, with few heat spikes. 1-1.2t / acre yields. 3am harvest and hand sort before transport to the winery. Cold soak. Fermentation with 22 day maceration. 22 months in 60% new French oak. Idea of Nomad was to ‘wander’ to the best vineyard for each vintage, but 10 of 11 have been Las Piedras fruit. 14.5% ABV. $175 / bottle RRP. Part of historic H. W. Crab Oakville Vineyard. Small, open-topped fermentation, with multiple hand punchdowns / day. 24 months in 1, custom-made French oak barrel. pH 3.7, 14.6% ABV. $150 / bottle RRP. Cooler site on the valley floor. Small berries and clusters, due to a special clone. 1.25t / acre. 14.9% ABV. $55 / bottle RRP. Boyd Vineyard and Bacigalupi Vineyard. Petite Sirah wine made separately and not included in the finished wine (10-day cold soak, then 4-day fermentation, finished in barrel). Petite Sirah skins retained, and added to destemmed, whole-berry Merlot for cold soak then co-fermentation. Up to 24 months in 60-70% new Francois Freres and other French oak. 0 g/L RS, 7.5 g/L TA, pH 3.42, 15.5% ABV. $150 / bottle RRP. 14.5% ABV. $50 / bottle RRP. 52% Rutherford, 25% Oakville, 23% Stag’s Leap District AVAs. 1.43 g/L RS, 6.8 g/L TA, pH 3.62, 14.9% ABV. $?? / bottle RRP. Introduced by Delia Viader. 94% Petit Verdot, 6% Cabernet Sauvignon and Cabernet Franc, from mountain vineyards. 14.5% ABV. $?? / bottle RRP. 14.7% ABV. $57 / bottle RRP. 14.5% ABV. $75 / bottle RRP. 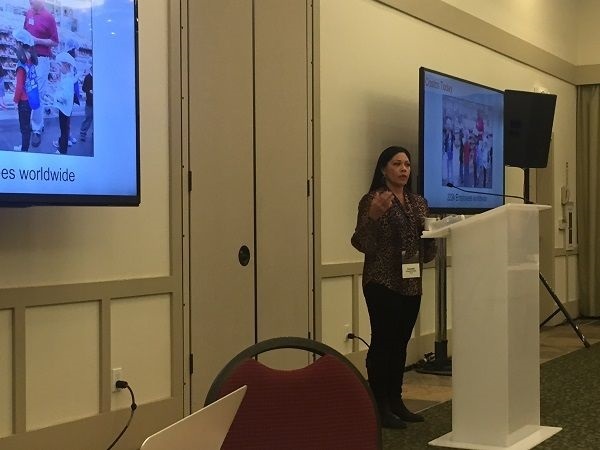 Annette Alvarez-Peters, AVP for Beverage Alcohol – the beers, wines and spirits division of CostCo – gave us an overview of their business and the process she and her team take to buying, Globally. Annette’s team of 11 domestic, regional US buyers and 8 international buyers are responsible for beers, wine and spirits across CostCo. CostCo is a $138.4Bn retail business, based East of Seattle, founded in 1983 that merged with another $8Bn business, Price Club, in 1993. 222,000 people work for CostCo, worldwide, across 107m sq ft of retail space. Employees tend to be long term and you are expected to work from the bottom up, in the shop-floor of warehouse, before you reach executive levels. Stores are 145,000 sq ft average sized warehouses, of which there are 762 warehouses. Food, beverage, toiletries, ‘hardlines’ of electrical goods, furniture, toys, pharmaceuticals, petrol, diamonds, and a wide range of goods are stocked. But a the range of SKUs is only 4,000, compared with much broader ranges of any good type than Wal-Mart or other competitors. SKUs are therefore on fast turnover and often being switched in and out – when it’s gone, it’s gone. Beverage alcohol sales totalled $4.4Bn, with 80% of warehouses carrying alcohol licenses – most variable in the US, due to State-level liquor licensing variation. 527 warehouses are in the US and 28 in the UK. In the UK a minimum proportion of sales must be to the trade, or CostCo could lose its licence, so the SKU mix is different to attract trade buyers, for example a greater range of beer SKUs than a typical US store, but a narrower wine reach. They have recently entered China, with a store outside Shanghai currently under construction. Market entries can take a lot of time, for example France needed licensing, which was repeatedly blocked by Carrefour objections. CostCo is a member-only, cash & carry wholesaler, originally only for businesses. However, consumers were able to become members, totalling 50m households of 91.5m cardholders, and 35% of CostCo members are now consumers earning over $100,000. Average household incomes of members is $92,000 vs a US average of $69,000. They target high income demographics through high-quality SKUs they stock, like 1er Cru Bordeaux, Rolex watches, diamond rings, BMWs etc. But these are simply priced lower than alternative sources of these goods, which does attract higher-income buyers who still want a good deal. Millenials are not yet their target because they don’t yet spend a lot of money, but Millenials who do shop at CostCo are attracted by organic SKUs, and CostCo are still working out what SKUs are most motivating for that demographic. Part of the proposition is that the shopping experience is fun. Part of that is that CostCo move the locations of categories often and don’t label zones, to encourage members to walk around and explore what’s being sold. That fits into a philosophy of “the right product, in the right place in store, at the right quality and in the right condition, at the right quantity – arriving and leaving at the right time to avoid over or under-stocking, and at the right price – low prices drive volume and show the best value on higher ticket items”. Operating margins are targeted at 14%, with membership fees on top of that of $60 / year for consumers or $120 / year for a business, meaning product pricing is low relative to all the markets they operate in. Membership fee revenue is $2.9Bn. Although they look for low costs from their suppliers, they don’t want to be more than 30% of any supplier’s business and they don’t want suppliers to sell to them on an unsustainable basis. There is some vertical integration, for example a new chicken factory has just been established in Nebraska, to support the 90M rotisserie chickens the business sells. Buying is done on a country or regional level, so that individual countries or regions of the Us can be flexible to their markets. That’s particularly true for alcohol in the US because of the 3 Tier system and its complexity, which is so different from other international markets. The prime focus in buying is not on the target margin, but how low they can get the price of that SKU to put it on the shelf. There are some Global-level deals done, but complexity of the US alone makes it difficult to do a product sourcing deal that gets a relatively homogeneous end-price. For wine, top-end labels are stocked, including 1er Cru Bordeaux. However there are many wineries who choose not to be sold in CostCo because the business is going to price their wine lower than the prevailing market price. That’s particularly the case for high-end California wines, where price is a key part of the brand and positioning. They observe significant regionality within the US, where e.g. Washington State residents will tend to drink Washington wines over California. 235 SKUs are stocked at any one time across Beverage Alcohol, meaning 1,500 SKUs could be ‘in play’ at any moment, to be rotated in and out. Buying starts with reading high-end magazines like Wine Spectator, Decanter etc to understand what their top-end consumers are interested in, as well as watching what’s happening in the on-trade for latest trends. They also go to trade shows, for example half the team went to the New York Wine Experience last week including new recruits. That helps establish relationships with the trade that can help identify new lines and get good-value deals. 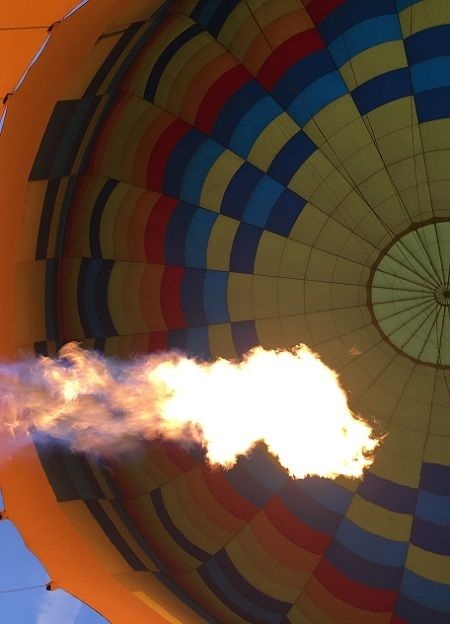 Buyers also go on buying trips, such as Bolgheri, Montalcino, Piemonte and Franciacorta, to find wines that would not readily be available in the US. The buyers might find 400 interesting wines, then narrow that down to 100 and then to 50. They then present the 50 best values identified back to the rest of the buying team. In 2018, they visited South America, the Rhône and Italy for buying trips. Once a SKU is identified, they have a network of importers for clearing, on lower-margin deals as the importers have not had to take sales costs, to get the wines into 45 US States. They try to minimise pricing differences on a given SKU across the US, which inevitably come about through 3 Tier variations and logistics differences. Kirkland Signature is a range of own-label wines that CostCo has had since 2003, where the buying team gets involved in the production process, and works with winemakers to get the best quality within a cost footprint. This range includes California wines, Prosecco and other Italian wines, covering 40 different wines in total. Which of these then get distributed to different regions and countries depends on those countries’ consumer preferences. Selling in-store includes roadshows for specific wines or regions and supplier tastings. Gina Gallo welcomed us to the Louis M. Martini winery, undergoing major restoration, originally founded in 1933, at the same time as Ernest and Julio Gallo founded their own winery. Roger Nabedian, SVP of the Premium Wine business unit then introduced Gallo and gave an overview of their view of the business of wine, in what proceeded to be an interesting follow on to our breakfast business session – once you got past a bit of the corporate gloss, but that was to be expected. Newly-promoted CMO, Stephanie Gallo explained Gallo’s ambitious Marketing strategy both to democratise wine and grow the total US wine consumption market – true ‘leadership’ of the market, in my view – and to target all consumer segments. She described the role of consumer insight and innovation in that strategy, which was followed by a more in-depth view of the consumer data Gallo have to deliver that insight, from Jennifer-Jo Wiseman, Head of Consumer Insights. Finally, Scott Kozel, VP of Winemaking for Premium Wines gave us a fascinating overview of the cost impacts of different viticultural, winemaking and packaging decisions, and how that varies the cost structures of basic $8 wines, mid-range $20 bottles and finally $80+ wines. This notion of making wine to a ‘cost footprint’ is something more people in the wine business should understand, if it is ever to make money, consistently. As Stephanie and Scott presented their respective sections, we paused for Scott to lead tastings of 2 flights of E & J Gallo wines, that helped illustrate on the one hand, wines to target different consumer groups and ‘democratise’ wine, as well the differences in winemaking choices across those different price categories. 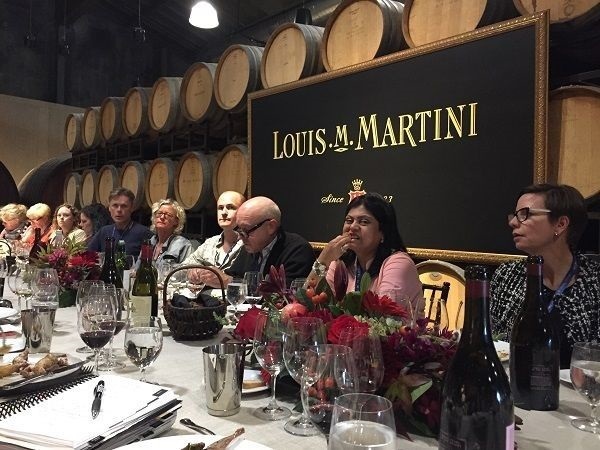 Amongst the wines, the Louis M. Martini Lot 1 Cabernet Sauvignon 2014 demonstrated that Gallo can indeed stretch up to high quality winemaking, albeit at a very ‘healthy’ $145 a bottle. E & J Gallo’s mission statement is to remain a family-owned, leading US winery, bringing California wines to the world. That means, simultaneously, to express premium wines of California at high quality that represent their place, and to help consumers understand and appreciate wine, to buoy-up the whole category of wine. Stephanie’s role across business units is to translate consumer insights into promotion of Gallo’s wines. Gallo operates 16 wineries across California and Washington States. In the coast, they farm 8,500 acres for quality wines, in addition of 16,000 Central Valley acres for entry level wines. They therefore have a large number of grower-partners that they have to work closely with if they want to, for example, innovate vineyard practices. They also have 24 international partners to import wines. 115 brands are owned, and 15,000 items are produced and sold across the world. Driving consumer appeal for products is critical to their expansion. They target all consumer segments with different wines and brands, and look at whole market growth as part of their remit, including wine acceptance across the whole US market. That includes general alcohol acceptance across different wealth and attitude demographics, and to drive household penetration of wine specifically, as well as growing understanding of wine usage occasions. Gallo started into premium wines with a sense of place and quality in the 1970s, much earlier than commonly expected. 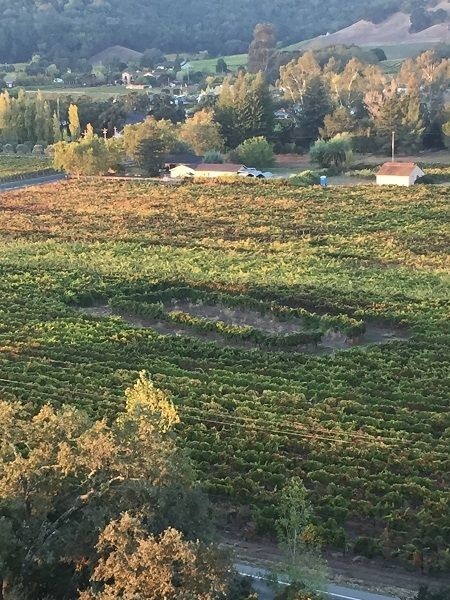 They invested significantly in vineyards in Sonoma. 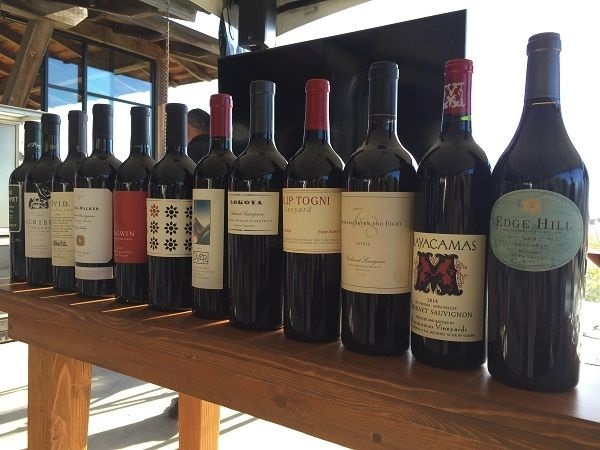 IN the last 20 years, Napa, Santa Lucia Highlands and Santa Barbara County vineyards have been rapidly added to expand the premium portfolio. Much of the investment focus has been in getting vineyards as the basis for premium wines, as much or more than wineries and brands. Napa’s largest vineyard, Stagecoach, at 600 acre of hilltop vineyard was recently acquired, for example. Wineries have been acquired as part of this, however, such as Talbott in Santa Lucia Highlands. Here, 8 of the business’ wineries can be split into to 2 within each winery – boutique production of minimum $50 / bottle wines, kept separate from a scaled-up winery on the same site, to leverage labour scale benefits on the same site whilst keeping processes focused on different price-point and different quality outcomes. They have recently partnered with Dave Phinney to develop new brands and world-class wines, after creating new hit wine brand, The Prisoner. 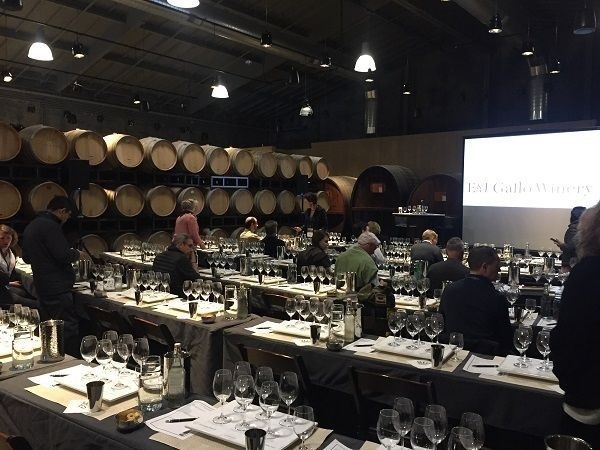 With Orin Swift, Phinney can continue to design and develop wines for segments he sees in the marketplace, without having to build a marketing and logistics network to deliver volume ‘at scale’ – Gallo provide that directly. Gallo’s wines are exported to over 100 markets worldwide, primarily with California wines, but also with partner wines like Orin Swift. Stephanie Gallo explained that Ernest and Julio’s philosophy from early on was to democratise wine at a time when the country was a beer and whiskey-drinking country. She still believes that has not been achieved, given that 33% of the US drink wine regularly while 27% do drink but not wine. Per capita consumption is only 2.3 gallons vs. 14 gallons in the US. US consumers are now starting to consider wine as a casual social beverage rather than an elitist drink for special occasions only. 79M Millenials have now all reached legal drinking age, many in households that drank wine, so that has normalised wine for that generation. It is a generation that doesn’t have history with wine so will experiment. Generation Z are just reaching legal drinking age and are digital natives who share the social experiences of wine drinking, making this yet more casual. Further, wine is being seen on TV and in other places outside traditional written media. That expansion of attitude has been reflected in the locations that are listing wine, including sports stadiums and other non-traditional wine locations, as well as Amazon and other new retailers have moved into off-trade wine sales. Casual drinking is also reflected in product types – easy-drinking wine styles, rose wines and sparkling wines. Premiumisation is an important trend for Gallo, but that has to be balanced by the need for democratisation of wine. Gallo are worried at the rate of producers rushing to premiumise, when the numbers of consumers moving into buying at a premium level may not be growing as fast. Reflecting their desire to democratise, and thereby grow total consumption, innovation has 2 focuses: how can new consumers be attracted to wine? How can the number of occasions where wine is drunk be increased? For bringing new consumers in, wines like Moscato have been very powerful. As a result Gallo Family Sweets range has been developed. Under screwcap for ease of opening, these are 9% ABV, fruit flavoured, sweetened and gently sparkling. With little distribution effort to date, this has already reached 5-600,000 cases, with many drinkers being new to wine. For new occasions, Gallo realised wine drinkers were switching out when looking for refreshment. They developed Barefoot Spritzers in cans, to meet that consumer need and keep wine drinkers in casual settings in the category. It also attracts some new consumers too. Jennifer-Jo explained Gallo’s consumer research database and approach, called KUBE (Knowledge Unearthed for Business Expansion). It comprises 23,000 alcohol consumers’ data and 10,000 shopping surveys, covering 37,000 shopping and 100,000 consumption occasions. Each respondent kept alcohol diaries, looking at purchases and consumption over several weeks. This dataset helps understand a consumer’s total drinking life and the variety of occasions and situations that actually come about with alcohol. The Kube has 3 dimensions: Consumption, Shopping and People, so can relate the demographic and attitudinal dimensions of the person to their buying and drinking. They have generated 6 consumer segments based on their psychographics, to explain why their behaviour is what it is. Examples of these include Status Seekers – risk takers and experimenters, who value what others think of them and want to be seen with the latest thing, Resilient Traditionalists – conservative, who have internally-focused, family values, and Relationship Connectors – for whom wine plays a social lubricant role, and they will stick to wines they know to deliver that. Socially-conscious Explorers, Forever Young and Newly Established rounded out the list. They have also identified 6 in-home occasions, on a 2×2 matrix, where alcohol is either more primary or more secondary to the situation, drinking either together or more alone: Complement my Meal, Evening Wind Down, Spur of the Moment, Thanks for the Drink, Hanging Out and House Party. Likewise on-premise occasions can be split into 7: After Work Socialising, New Places New Faces, What do you recommend, Feeling Sociable, Table for Two, The Meal. 8 shopping occasions were identified as well, covering stocking-up over impulse buying, etc. Shopping journeys for specific attitudinal segments can then be built, to help Gallo and retailers see how and where to make it easier for consumers to understand and build desire for wine at that buying point. Globally, similar segmentations have been done though the KUBE level not yet, as the US is such a major market for Gallo. Generally, from prior work, psychographic segments tend to be similar around the world and translate from market-to-market, but in different proportions. However, occasions tend to be very different, market-by-market. Scott then explained approaches to winemaking in the Group, and how choices influence cost, for 3 styles of wine. That began with vineyard flow, from establishment to management, to yield, and ultimately to harvest. Grape costs vary hugely depending on region of planting, from $300, $700, $1,400, $2,500, $5,500 and up to $40,000 / ton from Southern California to Napa Valley’s top vineyard. Dry Creek could be $2,500 but at Monte Rosso, 35 miles away, that is around $7,500 / ton. That clearly puts a huge stamp on the total cost of the final wine, since grape costs are often one of the largest cost components in any wine. Yield management is closely related to water availability, so understanding variations in vineyards can allow better management of yield across a vineyard area, as well as high-vigour issues. 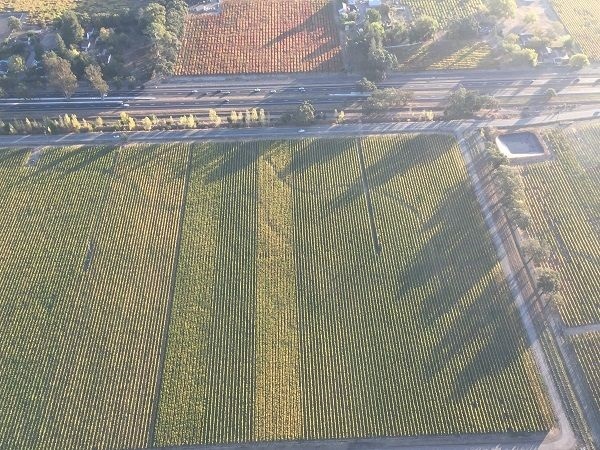 Gallo therefore conduct aerial soil surveys before planting, then adjust rootstock and clonal selections to adjust vigour across blocks, and vary irrigation, to make more homogeneous vineyards with better farming costs, while driving quality. Picking timing impacts quality, but also yield significantly due to shrivelling: 24°Brix might do 5t / acre, but that becomes 3.5-4t / acre at 28-30°Brix. Mechanisation with top-range picking machines, carrying on-board sorting, can deliver no MOG with fully-destemmed fruit at $90-100 / ton to pick vs. $180-190 / ton to pick by hand. Gallo experimented with side-by-side row picking of red grapes, made the wine and preferred the machine-picked in blind tasting. In the winery, scale impacts hugely. 1 winemaker with a 50t automated array of tanks can manage far greater volume than 7t fermenters operated by hand, driving cost variance from $1 of highly-automated generic wine production through to $13 for that hand-crafted approach. Likewise, oak chips or staves can keep cost to $0.25, whereas new French barriques are far more expensive at $11. Interestingly, the Coastal bottling has only a modest increase to $0.50, where perhaps used barrels and more sophisticated oak alternatives can deliver the quality consumers require. At the packaging stage, a heavy bottle, premium label and top-end closure again shifts cost from $2.50 to $14 – for example, corks can vary from a composite at $0.05 / unit, up to guaranteed TCA-free natural corks at $1.20 / unit. Finally, using in-house, high-speed bottling lines on constant operation makes the cost of bottling just $0.75 vs. keeping small, slow bottling lines idle or using mobile bottling lines, at $3.00 / bottle continues the broad spread of costs by operating step. It should be noted that these costs are not strictly costs – clearly, since they add-up to the price point in the entry level $8 bottle, and up to just above the lowest $80 price-point for the luxury end. Rather, slightly confusingly, these ‘cost’ figures include elements of the winery’s margins, allocated across all steps. Nevertheless, these give a clear view of the relative costs that are incurred by different winemaking approaches. The clear step-up in cost profile of moving to small-scale and often manual, hand-crafting of top-end wines is particularly interesting. Around 50% of retail comes back to the winery across all price points. Overall, the mid-tier of ‘coastal’ or equivalent tends to deliver the best returns for Gallo, but they believe good returns are available across all price-points through managing the cost footprint. We then tasted Flight 2, looking at the 3 different levels of price, style and cost footprint. We discussed Apothic’s origins. Gallo identified red blends early-on, as they started to get consumer traction in Washington State and realised a gap in the wider market. They then designed a wine that they thought would be widely appealing. In terms of packaging, consumer research was used to ‘personify’ the consumer need-state being addressed. The combination of ‘apothecary’ for the wine design as well as ‘epic’ being mentioned a lot in research from younger consumers, to yield the name Apothic. Illustration of a winery acquisition, made in 2015. No changes were made in winemaking, just expanding the scale. Grapes from across California – 20% in Sonoma, 80% Lodi. Some Gewurztraminer and Muscat for lift. Stainless steel. No MLF. Short maturation – 3-4 months from harvest. Screwcapped. 13.5% ABV. 2.8 g/L RS. $20 / bottle RRP. Illustration of a premium style. Later harvest. Barrel fermentation in 40% new oak. Screwcapped. 14.1% ABV. $45 / bottle RRP. Illustration of democratising wines. Charmat method. Central Valley fruit. 250,000 case production. 57 g/L RS, 10.5% ABV. $10 / bottle RRP. Brand created 2011. Lodi fruit. $750 / ton. 150-300t fermentation tanks. High-speed bottling. 0.5M cases. 13.5% ABV. $8 / bottle RRP. $2,500 / ton. 50t fermentation tanks with staves for the majority. Medium-speed bottling line. 285-300,000 cases. 14.5% ABV. $20 / bottle RRP. Edge of Napa Valley fruit including Stagecoach and some purchased fruit. Hand-sorted fruit. 7t fermenters. 2-5 weeks on skins. 22-24 months in new French oak. Bottling line used 2 times a year, maximum. 2,000 cases. 15.1% ABV. $145 / bottle RRP. A: Deep black with a very narrow, ruby-garnet rim. 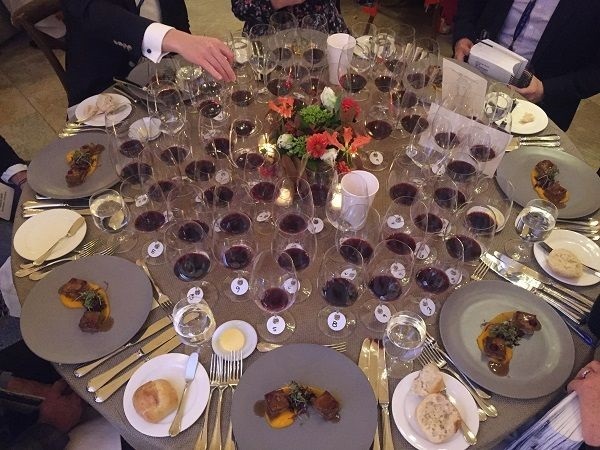 The formal tasting was followed by a formal lunch amongst the barrels in the Martini winery, with a suite of 6 Louis M. Martini and other Gallo brand wines served. These were a little hit-and-miss, though it should be noted that at least one of these, the Dark Horse Rose 2017 is only $8 per bottle. Small amount of Semillon. 14.4% ABV. $40 / bottle RRP. 15.1% ABV. $43 / bottle RRP. 12.5% ABV. $8 / bottle RRP. 14.1% ABV. $31 / bottle RRP. 14.2% ABV. $50 / bottle RRP. 60+% Zinfandel, blended with other varieties that vary annually, including Grenache, Syrah, Malbec and Petite Sirah. 2017 was Petite Sirah and Syrah only. Stagecoach and Santa Rosa fruit, mainly. 8 months in 30% new oak. 15.5% ABV. $50 / bottle RRP. 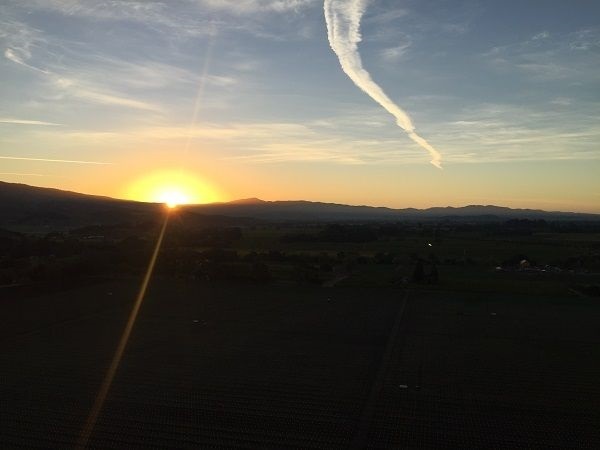 Kelli White, long-time, Roederer-award-winning journalist and senior staff writer for GuildSomm, moderated a tasting at the 15 acre OVID winery in Pritchard Hill, exploring the styles and influences of Napa’s mountain zones and AVAs. Kelli has also helped Alessandro Masnaghetti to map the vineyards of Napa, while she has just joined the MW study programme. Kelli introduced the geography and geology of Napa, covering both mountain and valley formation, which are critical for the complex soil structures of the Valley. Though considered as ‘northern’ California, it is worth remembering that Napa is still 5 hours’ drive from the northern border of California. 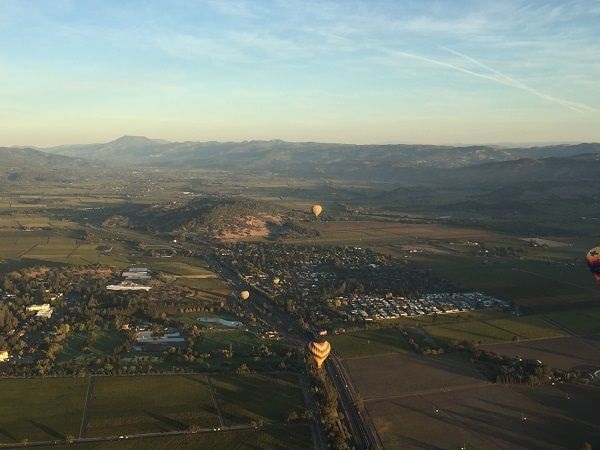 Napa was formed between 140 and 80M years ago as an inland sea, yielding clays and ultimately, after compression of those clays, layers of shale bedrock. 25-5M years ago, Napa-Sonoma volcanics were introduced as a result of the San Andreas fault formation. Unusually, these volcanics were thrown out of volcanic vents rather than resulting from volcano or mountain formation, and covered Franciscan Melange bedrock. The Franciscan Melange bedrock itself formed in the intervening period, 80-25M years ago. Here, material was scraped from the passing Farallon plate as it moved north, past and away from Napa. This scraping deposited much Magnesium-rich Serpentine which characterises the Melange. Mountain formation began around 3M years ago as a result of compression between the Pacific and North American plates. The eastern Vaca range resulted from splits in the crust which then progressively stacked on top of each other. By contrast, the Mayacamas, between Napa and Sonoma, were formed by a later, crustal ‘wrinkle’. The Vaca carries much volcanic materials in its soils, including tuffs, formed from compressed volcanic ash. 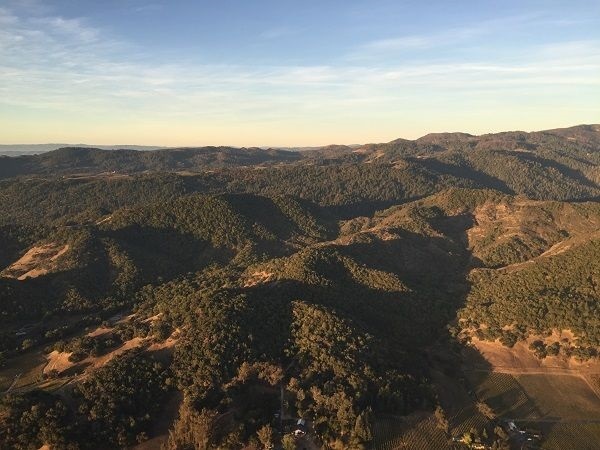 Curiously, the Mayacamas shed much of its volcanic material through erosion, so little is found from the north-central, Spring Mountain District, and southwards. Volcanics are thus, generally, relatively rare on the Mayacamas. Alluvial deposits down towards the Valley floor are therefore common and important. 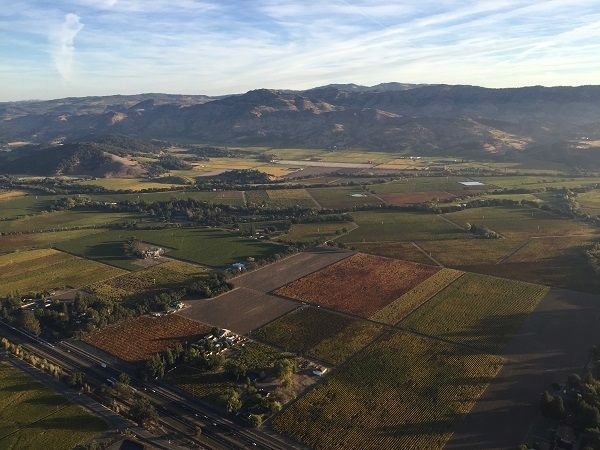 Given this rapid, recent geology, soils are therefore young – 80-140M for sands and shales, and 5-7M for the volcanics – and also extremely diverse, with 33 soil types identified in Napa. To compare soil ages, South Africa has some 500-600M year old granites in the Cape. Alluvial fans from the mountains to the floor of the Valley increase complexity, more on the Mayacamas side, in line with the washing-off of volcanic material. The long, alluvial gravel bench of Rutherford is perhaps the most famous. On the Vaca side, fewer fans exist, with Stag’s Leap being a notable exception. The Mayacamas side had slower water run-off when the range was forming, causing greater carriage and deposition of material into the Valley compared with the Vaca. 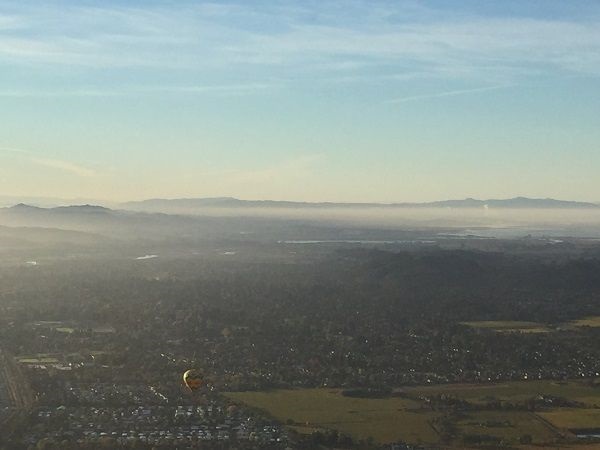 Napa has a Mediterranean climate, but marine fogs cool the climate significantly towards the southern, lower-altitude end, near San Pablo Bay. 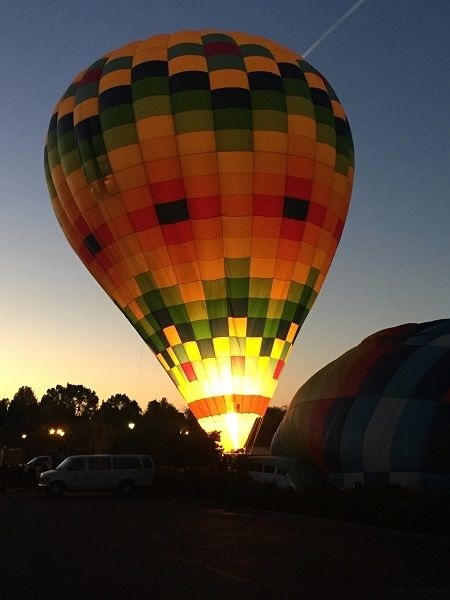 That causes higher-altitude Calistoga to be significantly warmer, with only the Diamond Creek gap bringing fog influence to the area around the town. The general position of the fog line means that higher elevations above the fog line are sunnier, though maximum daytime highs and nighttime lows are less than the valley floor. Diurnal temperature variations are significant on the floor of Napa, where the shift can be as much as 40°F. 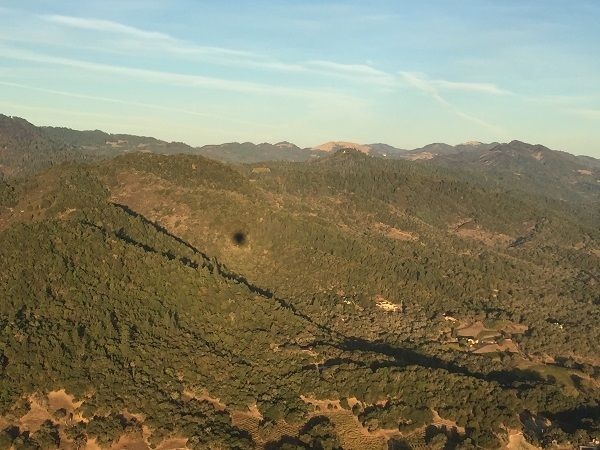 The Mayacamas and Vaca ranges both get similar amounts of rainfall, but the solar exposure of the western-face of the Vaca range dries it more than the Mayacamas eastern flank, making the Vaca range browner and more arid-looking – as was clearly demonstrated the next morning, when we took a daybreak balloon flight over the Valley. Increased elevation in the mountain districts is the same as in other mountain regions, causing lower temperatures, higher solar radiation, slower ripening and lower sugar accumulation, thicker skins and deeper colours, and rockier, freer draining, lower vigour soils. Kelli also speculates that it changes the attitude of the winemaker. We then tasted the wines in pairs by AVA. Each pair showed one wine in a more rugged style and the other in a more polished, ripe style. These, Kelli felt, reflected her sense of the diversity of attitudes of the winemakers involved, where mountain districts were more likely to find winemakers comfortable with more rusticity of style, in keeping with their wilder environment. Amongst the wines, Heidi Barrett’s skill came through clearly with Au Sommet 2014 Cabernet from Atlas Peak. Modern style, for sure, but a soaring-peak of a wine. The Diamond Mountain pair from Dyer and Lokoya both showed the strength of this small appellation, with Dana from Howell Mountain up there with them. OVID’s Estate red blend 2009 from the non-AVA of Pritchard Hill was equally fine, and a pleasure to taste with age. Overall, notable freshness of acidity held true, whether the wine was in a modern or ‘rustic’ idiom. Atlas Peak: in the southern Vaca, with more rainfall and cooled by the Bay, however it warms rapidly with a western exposure. Elevations range from 760 to 2,600ft. The 243Ha Stagecoach vineyard is the largest and most famous. It is not widely cultivated, with only 616Ha of 4,613Ha in the 1992 AVA, actually planted. Much is still cattle farming. Little viticulture existed before Prohibition and that died away. Major modern planting began in 1981. 65% is Cabernet Sauvignon. Howell Mountain: High-elevation plateau in the northern Vaca. The AVA was granted in 1984, with 405Ha planted of 5,666Ha, at 1,400-2,800ft elevations. 2,000 acres have been owned since 1909 by the temperant Seventh Day Adventists. The AVA is based on the fogline position, with red volcanic clay loam soils and some compressed volcanic ash zones. 69% is Cabernet Sauvignon. Randy Dunn brought acclaim to Howell Mountain in the 1970s and 1980s, and luxury Cabernet abounds – not all of which is in his highly-extracted style – plus some historic Zinfandel. 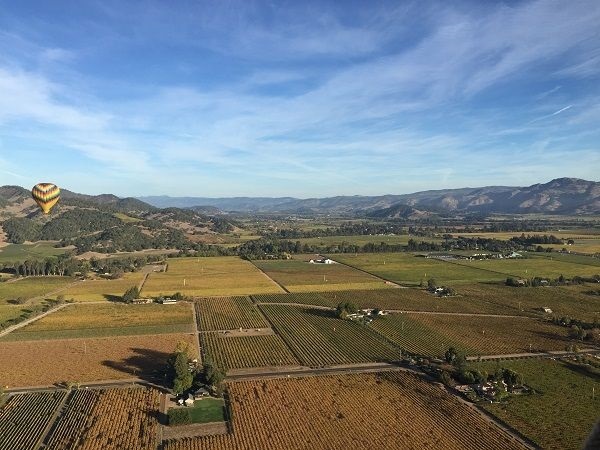 Howell Mountain does not reach the Valley’s valley-floor AVAs. Diamond Mountain: north-west Napa Valley in the Mayacamas, with the Diamond Creek ‘access route’ for coastal fogs, keeping it particularly cool in the otherwise hot Calistoga AVA that is around it. 202Ha of 2,023Ha of the AVA are planted, 81% to Cabernet. 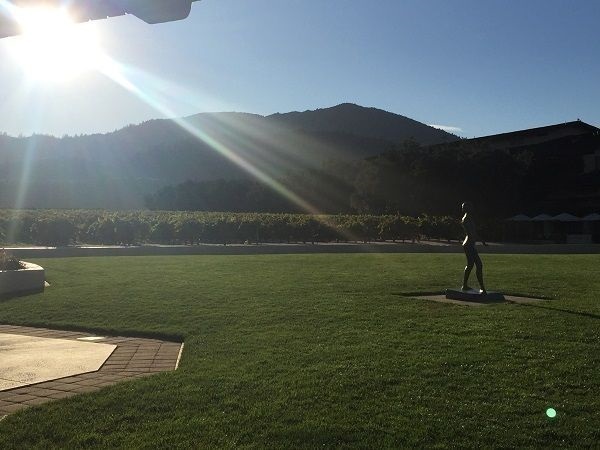 The first mountain vines to be planted by Schramsberg were here, while Diamond Creek Winery was arguably the first Napa ‘cult’ wine, based in the AVA. Spring Mountain: a district, rather than a mountain, with lots of natural springs in the hills. Least dominated by Cabernet Sauvignon, with Riesling and Pinot Noir also found. Transition from volcanic mountains to the north, to sandstone and shale in the south. Up the slope from St Helena and includes the terraced, Cain vineyard. Rolling, slightly jagged hills. Mt. Veeder: the mountain by the Bay, with scattered vineyards at 500-2,600ft elevation, and the lowest-density planting of any AVAs. Lots of Serpentine and Magnesium. Steep slopes prevent a lot of planting. It is the coldest and wettest mountain in Napa, so ripening is not always easy, which has made the AVA a less attractive and less fashionable place to grow grapes. 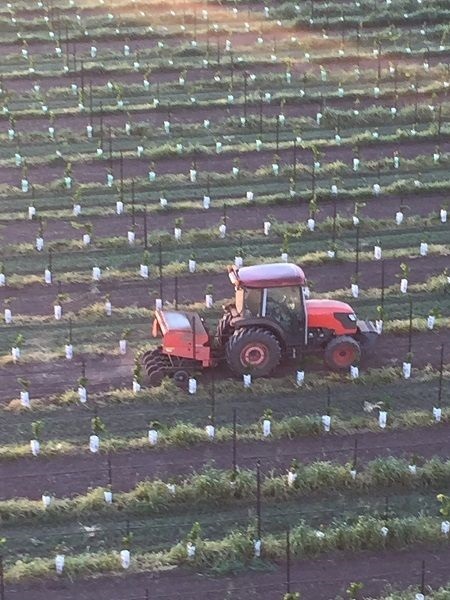 61% Cabernet Sauvignon is planted. Mayacamas is the oldest, longest-established winery, pre-Prohibition, but only 40 producers today. Classical Napa style. 97% Cabernet Sauvignon, 3% Petit Verdot. Western Vaca range fruit, near the summit. Made by Heidi Barrett. 18 months in 50% new French oak. 14.8% ABV. $250 / bottle RRP. New project based in north, Sonoma Carneros. More rugged, traditional, restrained style. Eastern Atlas Peak. East and Southeast-facing , volcanic tuff and gravel vineyard. 1,600ft altitude. Stainless steel fermentation, then neutral oak maturation. 6.4 g/L TA, pH 3.65, 14% ABV. $77 / bottle RRP. First vintage 2005. Volcanic loam soils. 58% Cabernet Sauvignon, 30% Cabernet Franc, 8% Merlot, 3% Petit Verdot. Concrete and oak tank fermentation. 20 months in 82% new French oak. pH 3.68, 14.9% ABV. $680 / bottle RRP library release. Clones 7 and 337 Cabernet Sauvignon. 20 months in 80% new French oak. 6.5 g/L TA, pH 3.84, 14.7% ABV. $209 / bottle RRP. New producer, but looking to a more historic style of Napa Cabernet. ENTAV 169 clone Cabernet Sauvignon at 2,150 feet on volcanic rock and weathered ash / clay. 24 months in 57% new French and Hungarian oak. <1 g/L RS, pH 3.82, 14.3% ABV. $120 / bottle RRP. 100% Cabernet Sauvignon. 25 months in 91% new French oak. 6.2 g/L TA, pH 3.82, 15.2% ABV. $415 / bottle RRP. Husband and wife team, making very small production wines. 7-10% incline mid-slope, North-facing vineyard on a 2.3 acre bench. 81% Cabernet Sauvignon, 14% Cabernet Franc and 5% Petit Verdot. 5.8 g/L TA, pH 3.74, 14.2% ABV. $80 / bottle RRP. 1,200-1800ft. 19 months in 99% new French oak. 14.5% ABV. $375 / bottle RRP. British owner, who attended the University of Bordeaux’s first oenology class, then worked in Chile. Founding winemaker at Chalone after working at Mayacamas. [add in]. At or under 14% so don’t have to list ABV. $135 / bottle RRP. N: Old leather, white pepper and dust. Rocky. Picked early-mid October. Hand-sorted twice. Whole berry fermentation, with 30% in new French oak barrels with 50-60 days average maceration. 26 months in new French oak from artisan coopers. 14.9% ABV. $185 / bottle RRP. 92% Cabernet Sauvignon, 4% Merlot, 4% Cabernet Franc. 32 months in neutral French oak. 14.25% ABV. $125 / bottle RRP. Modern, richer style. Site mainly planted to Sauvignon Blanc and Semillon. 68% Cabernet Sauvignon, 10% Petit Verdot, 10% Merlot, 8% Malbec, 4% Cabernet Franc. 75% new French oak. 15.5% ABV. $250 / bottle RRP. 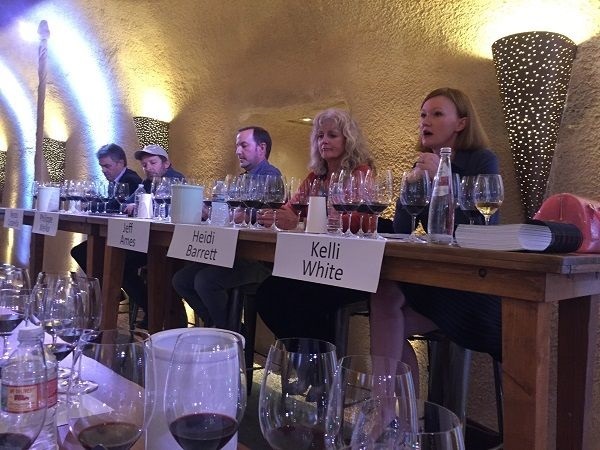 Moving to Stag’s Leap Wine Cellars, Kelli White then led a panel tasting with legendary consulting winemaker, Heidi Barrett along with fellow consultants, Jeff Ames, Philippe Melka and Renzo Cotarella. She began by reminding us that consulting on winemaking is quite different task and role than being a winemaker. Heidi became a consultant in the 1980s and owns La Sirena. Philippe began at Dominus in the early 1990s, before moving to Seaver as his first consulting project. Jeff is a more recent arrival to the Valley. Renzo is the chief winemaker for all Antinori winemaking worldwide, with Antica being Antinori’s first Napa project. Heidi considers herself as an independent winemaker for small wineries today, rather than a consultant, since she works for clients who don’t have a winemaker, working only with assistants. She has had consulting clients before that she would see a few times a year for tasting, thoughts on blending, help with corrections if needed, but didn’t work crush. She is paid monthly depending on level of support required, but on her partnership brands, she’s paid on a share of partnership profits. Her perspective on the importance of scores is that is was very important in the 1990s and 2000s, but there has been a substantial change towards customers looking to find experiences, authenticity, a story behind wines and not conversations about point scores, at least for domestic customers. Points still count substantially in some export markets. Jeff came from Alabama and arrived in Napa in 1999 while working for Decanter. The two wines he brought are from 2015, planted in 1997 to the same clone, with the same barrels and winemaking process. 85% of the consulting he does is on Cabernet-based wines. Jeff determines the picking date. He also makes the oak-buying decisions. In opening discussions with new clients, they may demand a wine ‘like XYZ’, but he will only promise that if the fruit source is similar. For him, he is paid as a salary, not on outcomes like scores. Renzo grew up in a wine family then studied chemistry, before oenology. He then began working to make wine for the Antinori family in the 1970s, that ultimately could be shared with others. His intent is to make wines that reflect the personality of the property or family, not the personality of the winemaker. He works with Antinori estates that have their own winemakers and agronomists, who know the individual vineyards better than he does, so he consults and advises this team. He prefers to let the winemakers take responsibility. With red wines, managing and controlling the tannins is Renzo’s biggest focus – fruit selection, punchdowns in conical tanks which needs less firmness to punch down and less mechanical action, using a temperature of fermentation that is higher in early stages then reducing temperature as alcohol rises to reduce tannin extraction. Amongst the wines shown, having enjoyed 2004 before, it was nice to see the 2015 Stag’s Leap FAY Cabernet Sauvignon doing very well. Close behind were both of Jeff Ames’ wines – the still-youthful TOR Herb Lamb Vineyard Cabernet Sauvignon 2015 and the Rudius Kaley Elizabeth 2014. Quixote Cabernet 2016 from Stag’s Leap District was up there too. Amongst a line up of good-to-excellent wines to which we were treated, it must be said. Heidi Barrett consulting. [add notes]. Blend of 7 varieties to give layers of flavour without necessarily being able to identify particular, single flavours. Bordeaux meets the Rhone. Syrah and Cabernet Sauvignon main components, then Merlot and Grenache, with Petit Verdot, Petite Sirah and Cabernet Franc for spice. Shows the skill of a consultant as blender. Old-looking bottle with a treasure-map style label, to reflect the ‘pirate’ theme. 22 months in 40-45% new oak. 6.1 g/L TA, pH 3.79, 14.7% ABV. $65 / bottle RRP. Heidi Barrett consulting. Steep, terraced vineyards that Heidi had been buying since 2007, but have now been grubbed up in favour of Cabernet Sauvignon. 2012 was the first time there was enough for a varietal wine, instead of blending into Pirate. [add notes]. 6.4 g/L TA, pH 3.82, 14.7% ABV. $45 / bottle RRP. Jeff Ames consulting. Wild-yeast fermentation in a single, closed tank, at maximum 85F, for 14 days with maximum 2 pumpovers / day. Natural MLF in barrels, followed by 18 months 70% new Taransaud French oak. 15.1-15.2% ABV. $100 / bottle RRP. Jeff Ames consulting. Whole-berry fermentation in closed tanks, for 16 days with 2 pumpovers / day. Natural MLF in barrels, followed by 22 months in 70% new French oak. No fining or filtration. pH 3.65-7, 15.1-15.2% ABV. $125 / bottle RRP. P: Ripe, focused, crème de cassis fruit with more overt sweetness. Not so much freshness, but supple. Dense, dark chocolate, clove and sweet cinnamon oak with a subtle coriander seed tang. Velvet mouthfeel, with fairly firm, very fine-grained tannins. Silky. Warming touch to the long finish. Sophisticated, in its ripe idiom. Drinkability may be a question? Philippe Melka consulting. Cooler clay – unusual on a hillside estate. 96%, 4 and See clones of Cabernet Sauvignon, 4% Sodero-clone Malbec. Bottled July. 5.8 g/L TA, pH 3.81, 14.1% ABV. 500 cases. $125 / bottle RRP. N: Floral rose tones to raspberry and black cherry fruit. Ripe, jammy fruit. Black, dry earth aromatics to clove and dark chocolate subtle oak tones. Philippe Melka consulting. Rocky, eastern-Oakville site. 60% new French oak. 14.5% ABV. 1,200 cases. $160 / bottle RRP. Renzo Cotarella consulting, since Warren Winiarski asked Antinori to buy the estate. Always a more elegant counterpoint to SLV’s power. Less than 2t / acre, leading to a more powerful style than typical. Stainless steel fermentation. MLF. 22 months in 89% new French oak. 5.1 g/L TA, pH 3.78, 14.5% ABV. $150 / bottle RRP. Renzo Cotarella consulting for the Antinori’s own estate. 24 acres on West-facing, well-drained, volcanic soils at 1,100ft altitude. High density planting and low-trained to absorb radiant heat from the ground. Destemmed and sorted. 7 separate plots, stainless steel fermented with temperature control for 15 days. Racked to 100% new French oak for MLF and 18 months’ maturation. ? ?% ABV. $110 / bottle RRP. We closed out our final full day in Napa with a reception then gala dinner at Stag’s Leap Wine Cellars. 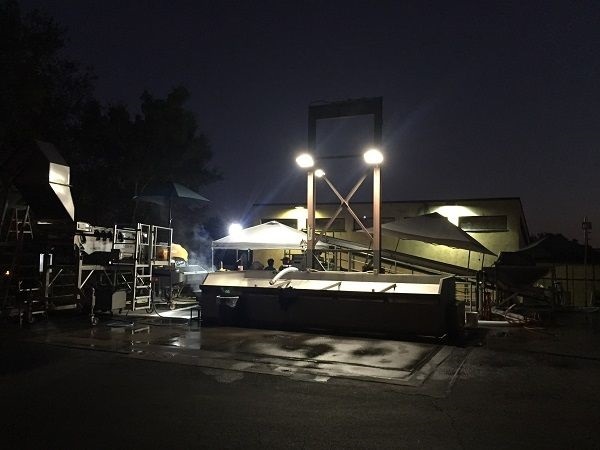 On our way in, it was a good reminder that this was a fully-operational winery, still in harvest-swing, as the team cleaned-down their crushpad ahead of the next morning’s pre-dawn pick. 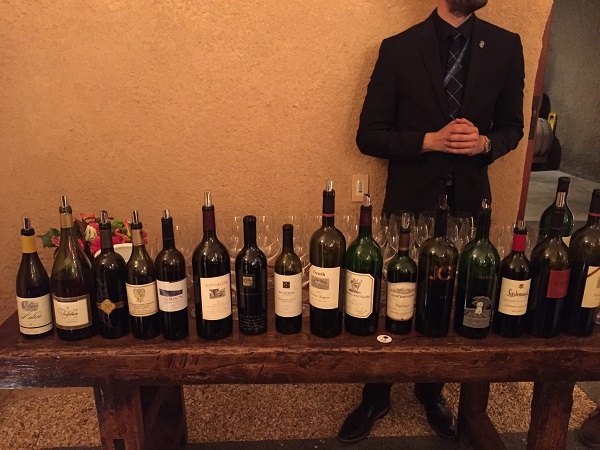 A near-full range of Stag’s Leap wines were made available for us to taste, especially the exceptional 1994 Cask 23 Cabernet Sauvignon, which was a real treat. Tasting also the 2015, I can’t help but wonder if the new, post-Warren Winiarski regime is moving towards a more contemporary, riper style – whether for good or ill? Fruit from across Southern, cooler Napa Valley. 88% MLF. 7.5 months on lees in 34% new French oak. 5 g/L TA, pH 3.65, 14.5% ABV. $35 / bottle RRP. 86% Sauvignon Blanc, 10% Sauvignon Musque, 3% Semillon, 1% Muscat Canelli. Fruit from Usbelli (Pope Valley), Ranch Chimiles (Wooden Valley), Danita Ranch and Zulu (Oak Knoll), Beckstoffer Melrose (Rutherford) and Solari (Calistoga). 52% stainless steel, 47% neutral French oak and 1% concrete cool-temperature fermentation. 6 months on fine lees with bi-weekly stirring. 5.8 g/L TA, pH 3.38, 14% ABV. $26 / bottle RRP. 100% Cabernet Sauvignon. Lots vinified separately and aged 21.5 months in 95% new French oak, with blending near the end of maturation. 5.4 g/L TA, pH 3.75, 14.5% ABV. $175 / bottle RRP. 100% Cabernet Sauvignon. 58% SLV blocks 2A, 2B, 3A, 3B, 4, and 42% FAY blocks 2A, 3A, 7A, 10A, 12A. Lots vinified separately and aged 21.5 months in new French oak, with blending near the end of maturation. 5.4 g/L TA, pH 3.83, 14.5% ABV. $295 / bottle RRP. 91% Cabernet Sauvignon, 6% Merlot, 2% Petit Verdot, 1% Malbec. Napa vineyards from various AVAs. 15.5 months in 30% new, 96% French and 4% American oak. 5.1 g/L TA, pH 3.91, 14.5% ABV. $69 / bottle RRP. 98.4% Cabernet Sauvignon, 1.4% Merlot, 0.2% Petit Verdot. Blend of SLV and FAY. MLF. 18 months in new French oak. 5.3 g/L TA, pH 3.53, 13.7% ABV. $100 / bottle RRP. The reception was followed by an exceptional, fully-poured wine dinner. Some true gems were served to us that we were again, privileged to encounter. 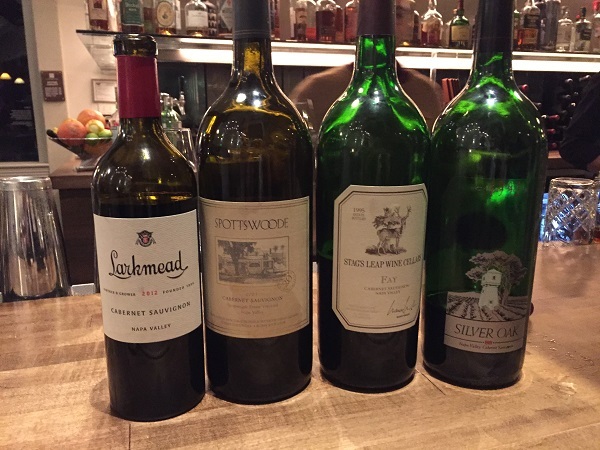 Especially the superb 1992 Silver Oak Cabernet Sauvignon from magnum, that I went back to several times, alongside Stag’s Leap’s FAY Cabernet Sauvignon 1995. Both of these came back with us for the after-party! 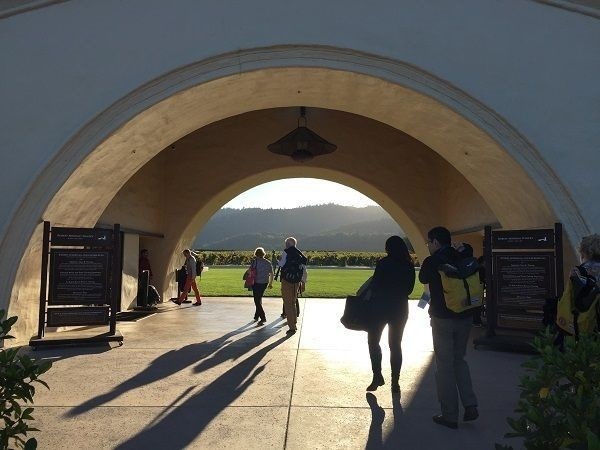 We were joined by many winemakers, including Lou Kapscandy, to whom I spoke briefly, Tor Kenward of TOR and Cathy Corison, often lauded for her restrained expressions of Napa Cabernet. The first couple of times I encountered Corison wines, I didn’t get them but have come to understand them – with the 2014 Kronos Cabernet Sauvignon here being a fine example. Beth Novak Milliken of Spottswoode was kind enough to bring not only their pretty decent 2014 Estate Cabernet Sauvignon as planned, but also a bottle and magnum of 2001 and the supreme Spottswoode Estate Cabernet Sauvignon 1998 respectively. 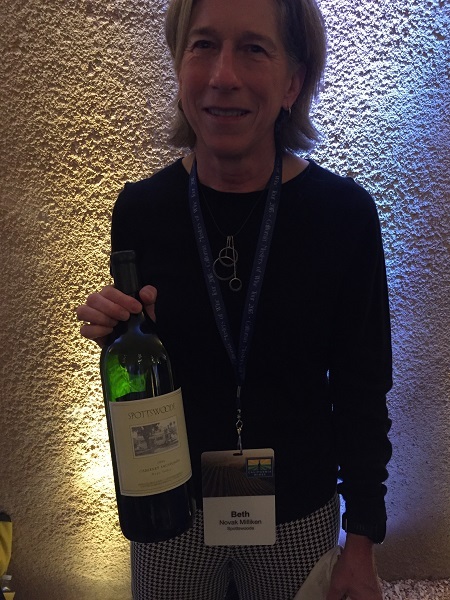 Suzanne Groth went one step further and apparently switched out the 2015 and presented the excellent 2009 Groth Reserve Cabernet Sauvignon, which came across as still pretty youthful – maybe we did get the 2015?! Most of the winemakers introduced their wines and perhaps talked a little about their perspective on Napa. Jean-Claude Boisset, by contrast, gave a curious speech in which he lauded women in wine (good), then proceeded to ‘jokingly’ insult the MWs in the room (bad). 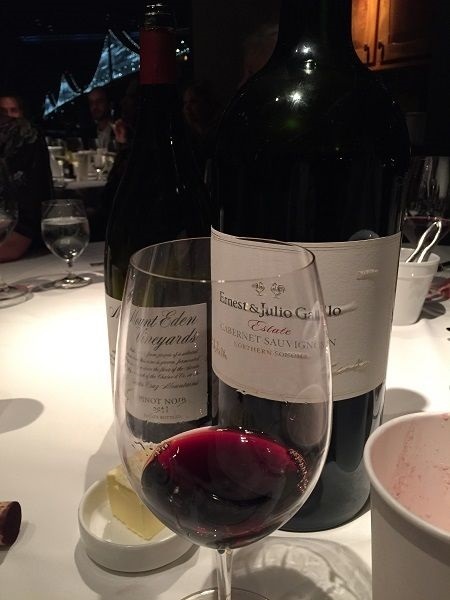 In a moment of schadenfreude, his modestly-entitled, gold-labelled, JCB No 1 Cabernet Sauvignon 2009 was appalling – overripe, over-oaked, over-extracted and over-priced at $300 a bottle. Block A26 and coincidentally, they are just celebrating the 26th generation of the Antinori family. Clone 4 at 1,420ft on Bale clay- and Perkins gravelly-loam, volcanic alluvial soils. Destemmed and gently pressed. Cold-settled in stainless steel before inoculated-yeast addition. Fermentation in 100% new French oak, then MLF and 10 months on lees in barrel. ? ?% ABV. $55 / bottle RRP. Presented by Hailey Trefethen, winemaker and 3rd generation of the family, who are celebrating their 50th vintage. 30th September harvest was their latest ever Chardonnay vintage at that time. 20 weeks in 72% new French oak. 7.1 g/L TA, pH 3.09, 13% ABV. $?? / bottle RRP. East-West facing blocks on well-drained, rocky soils. Small stainless steel tank-fermentation with 3 gentle pumpovers / day. 3 months in neutral French oak then blended. 17 months in 80% new French oak. 6.2 g/L TA, pH 3.59, 14.4% ABV. $95 / bottle RRP. 97% Merlot, 3% Cabernet France. Aged 70% new, 95% French and 5% Hungarian oak. 14.4% ABV. $375 / bottle RRP. Cabernet Sauvignon, planted 1971. 13.5% ABV. $185 / bottle RRP. 86% Cabernet Sauvignon, 10% Cabernet Franc, 4% Petit Verdot. 20 months in 60% new French oak. ? ?% ABV. $190 / bottle RRP. Extra wine. Magnum. ? ?% ABV. $?? / bottle RRP. Mainly Cabernet Sauvignon. Hillside, terraced block with soils containing obsidian. Hand-sorted. Wild-yeast fermentation in small tanks. Natural MLF. 20 months in 35% new French oak. 5.9 g/L TA, pH 3.65, 14.5% ABV. $65 / bottle RRP. 2010 first vintage. 100% Cabernet Sauvignon. 71% Diamond Mountain, 22% Oakville, 3.5% Atlas Peak, 3.5% Mt Veeder. 27 months in new French oak. 5.9 g/L TA, pH 3.74, 15.4% ABV. $110 / bottle RRP. Different wine than the 2015 planned. 95% clones 7, 15 and 337 Cabernet Sauvignon on 039-16 and SO4 rootstocks in Yolo loam and gravel, 5% Merlot. Mechanical sorting. 3-day cold soak. Inoculated-yeast fermentation in small lots. 8 months in new French oak. Blended, then 14 more months in same barrels. ? ?% ABV. $?? / bottle RRP. 12.5% ABV. $?? / bottle RRP. 96.4% Cabernet Sauvignon, 2.2% Petit Verdot, 1.4% Merlot. 18 months in Nevers French oak. 5.4 g/L TA, pH 3.49, ? ?% ABV. $70 / bottle RRP. Cool vintage. 10th release. 76% Cabernet Sauvignon, 10% Merlot, 8% Cabernet Franc, 4% Malbec, 2% Petit Verdot. 29% Sonoma Valley, 26% Knights Valley, 15% Dry Creek Valley, 30% Alexander Valley. Components aged separately for 24 months in 51% new French oak. Blended then 1 year in bottle, pre-release. 5.7 g/L TA, pH 3.74, ? ?% ABV. $70 / bottle RRP. Jean-Claude Boisset. Juice 26 days on skins, then 4-day cold soak. Fermentation followed by additional 9-12 days on skins. 60% new, M+ toast French oak.? ?% ABV. $300 / bottle RRP. 94% Cabernet Sauvignon, 6% Petit Verdot. 18 months in 54% new French oak.? ?% ABV. $109 / bottle RRP. Bale loam and clay-loam, with rocky old stream beds. Wild yeast fermentation. Longest and slowest fermentation ever, with maximum 2 pumpovers / day. Gentle press to Darnajou and Taransaud French oak. No acidification (To Kalon gives good natural acidity), fining or filtration. <30ppm free SO2 at bottling. ? ?% ABV. $225 / bottle RRP. And we were not the only wine early-birds out – brave folks! 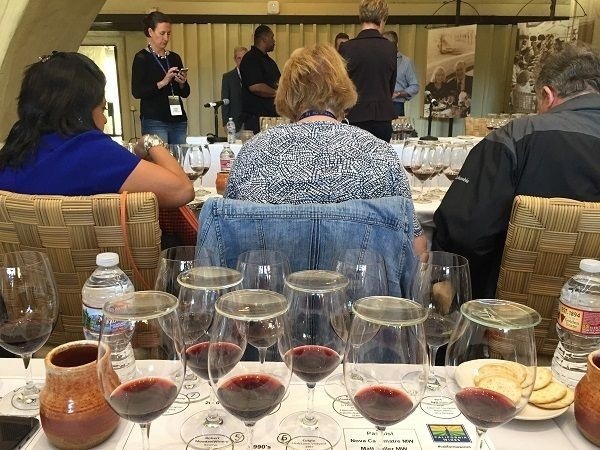 Mary Margaret McCamic MW, who has run sales and marketing for Screaming Eagle since 2015, led a first-ever masterclass tasting of component wines and finished blends of Screaming Eagle Cabernet Sauvignon, and its Merlot expression, The Flight. She was joined by winemaker, Nick Gislason, who has made the wines since 2010. In describing the vineyard’s meso-climate, the variations in soil type and drainage, and in the range of Cabernet Sauvignon, Merlot and Cabernet Franc expressions they have available, they were able to explain their approach to blending. This demonstrated just how fine both wines are, that both justify the hype and explode any ‘cult Cabernet’ prejudices we may have had. My full write-up, going into details of the terroir and blending process, with tasting notes on the components and the finished wines can now be found here on Decanter.com. For lunch on our final day of the official trip, we filled the relatively new and trendy Compline restaurant-wine bar-shop in downtown Napa. Run by Ryan Stentins and Matt Stamp MS, this has quickly become a go-to place for winemakers as well as wine-lovers in and around Napa. 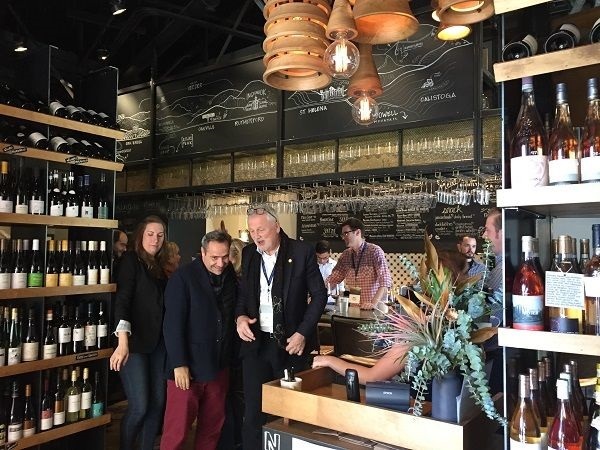 There we were treated to an array of wines – primarily red and mostly blends – with the winemakers introducing their wines, and accompanied by great fries and fine-quality burgers. Although the intro was a bit lengthy, telling the vineyard’s story in great depth, DeSante The Old Vines Field Blend 2016 white was fresh and interesting. I was also quite taken by White Rock’s Claret 2015 from Napa, which handled its ripe style well. Old plot, saved from being grafted-over to Cabernet Sauvignon, now farmed organically and without sulfur use. Planted over 70 years ago, with some over 90 year old vines, either on St George or own rooted. 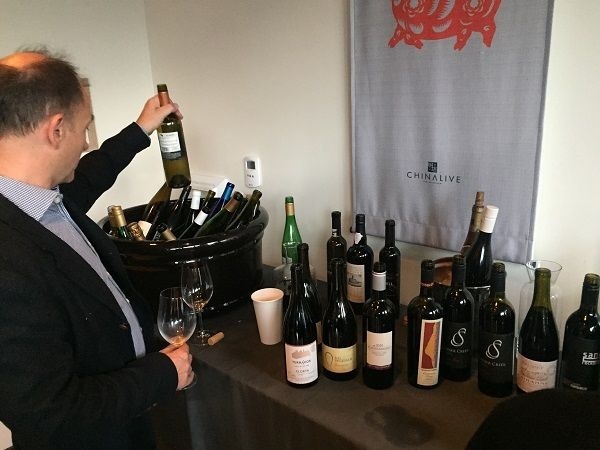 Multiple varieties including Semillon, Golden Chasselas and Pinot Blanc, as well as Green Hungarian and Sauvignon Vert that are no longer registered varieties in California, so varieties may not appear on the label. 1t / acre or 16HL / Ha yields in a good year. Bottled unfixed and unfiltered, with some lees. 7 g/L TA, pH 3.4, 12.5% ABV. $40 / bottle RRP. Alban clone, on rocky hillside, in Eastern Alexander Valley. Head trained. Biodynamic since 2012. Whole-bunch, wild-yeast fermentation, foot trodden for first 4 days’ maceration, then gentle pumpovers. Pressed into neutral French oak for 12 months, untracked. No fining or filtration. 6.6 g/L TA, pH 3.52, 14.2% ABV. $38 / bottle RRP. 75% Merlot, 24% Petit Verdot, 0.5% Cabernet Sauvignon, 0.5% Sangiovese. 50% new French oak. 13.5% ABV. $35 / bottle RRP. c. 75% Malbec (Haystack Vineyard Atlas Peak, Cloud’s Nest Vineyard Mt Veeder), Cabernet Franc and Petit Verdot (Central Park West Vineyard St Helena), Merlot (Vera’s Vineyard Napa). 6 g/L TA, pH 3.85, 14.9% ABV. $65 / bottle RRP. 85% Merlot, 15% Cabernet Sauvignon. Wild yeast fermentation. 11 months in neutral French oak. Only additions of SO2. ? ?% ABV. $28 / bottle RRP. 82% Cabernet Sauvignon, 10% Cabernet Franc, 8% Merlot. Hay Station Ranch fruit at 2,400ft, with decomposed granite, volcanic sediment and red clay. Aged in small oak barrels underground. 2.6 g/L RS, 6.64 g/L TA, pH 3.81, 15% ABV. $45 / bottle RRP. Cabernet Sauvignon (Miller, River Ranch and Twin Oaks, Lodi), Malbec (Jahant Woods II, Lodi), Petit Verdot (River Ranch), Merlot and Cabernet Franc (Miller Vineyard, Clarksburg). 14.8% ABV. $30 / bottle RRP. 65% Cabernet Sauvignon, 23% Merlot, 6% Cabernet Franc, 6% Petit Verdot. 22 months in French oak. 5.8 g/L TA, pH 3.73, 14.3% ABV. $54 / bottle RRP. Organic and sustainable certified vineyards across California, mostly Mendocino. Oak aged. 2 g/L RS, 5.9 g/L TA, pH 3.69, 13.8% ABV. $16 / bottle RRP. Different approach to main Paul Hobbs brand wines, with less new oak and more youthful, lively profile. 87% Cabernet Sauvignon, 3% Merlot, 3% Cabernet Franc, rest Petit Verdot and Malbec. Coombsville, Yountville, Calistoga and St Helena fruit. 18% new French and American oak. 14.5% ABV. $?? / bottle RRP. In San Francisco the trip wrapped up with a sparkling reception then relaxed, wind-down dinner at Waterbar, in the Embarcadero district of the city. 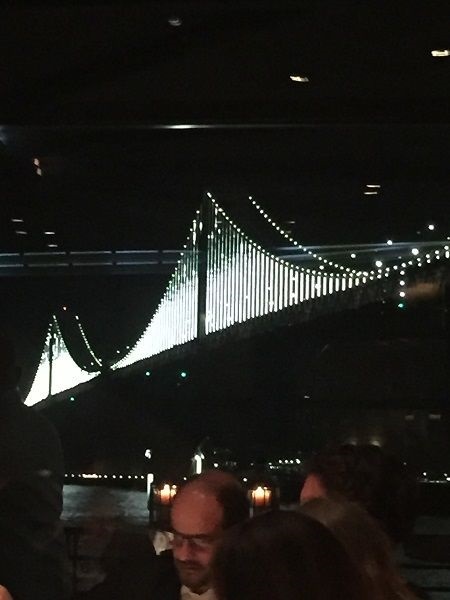 Our dining room overlooked the patterned, art-installation, light show now adorning the recently-enhanced Bay Bridge. My note-taking, only on my iPhone, was unsurprisingly less detailed and more casual! Amongst the sparkling wines, J. Schram 2009, the top cuvée of Schramsberg, stood out. Its 2000 late disgorged sibling was interesting, but a little too far on the oxidative side, suggesting too long on lees is possible. Taittinger’s Domaine Carneros Le Reve Blanc de Blancs 2011 was pretty as well, though not particularly good value at $115 a bottle. 63% Pinot Noir, 37% Chardonnay. 3-day skin contact for proportion of Pinot must. 9 g/L RS, 7.1 g/L TA, pH 3.13, 12% ABV. $42 / bottle RRP. 100% Chardonnay. 9 g/L RS, 7.1 g/L TA, pH 3.2, 12% ABV. $115 / bottle RRP. 60% Pinot Noir, 40% Chardonnay. Hand picked. Gentle press. 36-48 hour skin contact for 50% of Pinot Noir. 2 years on lees. 7.4 g/L TA, pH 3.11, 12.5% ABV. $29 / bottle RRP. 67% Pinot Noir, 33% Chardonnay. Gentle whole-bunch press. First press to stainless steel for cool 55-60°F fermentation. After 6 months, 14 lots blended for 2nd fermentation in bottle. 5.5 years on lees. 7.2 g/L TA, pH 3.19, 12.5% ABV. $50 / bottle RRP. 86% Chardonnay, 14% Pinot Noir. 115 cool-climate sources: 50% Sonoma (mainly Horseshoe Bend and Keefer, Sonoma Coast), 41% Napa (mainly Schwarze and Jones, Carneros (Napa)), 4% Mendocino, 4% Marin. 27% barrel-fermented. Partial MLF. 7 years on lees. 10.9 g/L RS, 8.6 g/L TA, pH 3.01, 13.3% ABV. $120 / bottle RRP. Disgorged April 2018. 80% Chardonnay, 20% Pinot Noir. 60% Napa (mainly Schwarze and Tognetti, Carneros (Napa)), 20% Mendocino (mainly Rose, Anderson Valley), 12% Sonoma, 4% Marin (Pacheco). Gentle press. 38% barrel-fermented. Partial MLF. 17 years on lees. 8 g/L RS, 9.1 g/L TA, pH 3.08, 12.8% ABV. $185 / bottle RRP. 98% Sauvignon Blanc, 2% Semillon. Hand harvested. Whole-bunch pressed. Almost all cool, slow, barrel-fermented in 42% new French oak. 9 months on lees with hand-battonage 2 times / week in cement eggs. 6.3 g/L RS, 6.7 g/L TA, pH 3.2, 14.5% ABV. Magnum. Steep, South-facing, dry-farmed, organic plot, planted on own-roots in 1991. 12% ABV. $95 / magnum RRP. 100% Chardonnay. Low vigour, well-drained sandy vineyard with small-berried Hyde-Wente clones. Whole-bunch pressed. Wild-yeast fermentation and MLF in 40% new, 228L French oak. Weekly battonage. Unfiltered. ? ?% ABV. $65 / bottle RRP. 828, 777 and 115 clones on 101-14 rootstocks, at 550ft, North-South orientation with VSP, planted 2001 on marine quartz sandstone and Goldridge soils. 100% whole-bunch, wild-yeast fermentation. Natural MLF in older oak, then 17 months on lees without racking. 12% ABV. $120 / bottle RRP. Wild-yeast fermentation in 14% new French oak, then 13 months on lees. 13.8% ABV. $78 / bottle RRP. 7.5 gL TA, pH 3.55, 13.5% ABV. $60 / bottle RRP. 18 months in 36% new French oak. 13.6% ABV. $146 / bottle RRP. 96% Cabernet Sauvignon, 3% Petite Sirah, 1% Merlot. Concannon Clones 7, 8 and 11 from Chateau Margaux. 2.1 g/L RS, 6.7 g/L TA, pH 3.71, 13.5% ABV. $40 / bottle RRP. 3L double-magnum. Dry-farmed, head-trained Zinfandel from Mendocino, Lodi and Paso Robles, Petite Sirah from Lake County. Aged separately in American and French oak. Blended then aged in 8-12 year old barrels including 24% old and 3% new Bourbon. 5.7 g/L TA, pH 3.61, 15.5% ABV. $20 / bottle RRP. 30 year old vines on South-west facing, fractured stone vineyard. Certified biodynamic. Open-top fermenters. 20 months in French oak. 6.6 g/L TA, pH 3.46, 14.5% ABV. $59 / bottle RRP. 88% Cabernet Sauvignon, 10% Merlot, 2% Petit Verdot. 33% Oakville, 20% Coombsville, 15% Atlas Peak, 10% Diamond Mountain, 9% Oak Knoll District, 8% Howell Mountain, 7% Mt Veeder. 20 months in 80% new French oak. 5.6 g/L TA, pH 3.77, 15% ABV. $?? / bottle RRP. 78% Cabernet Sauvignon, 8% Malbec, 6% Merlot, 4% Petit Verdot. Gravelly loam soils. Stainless steel fermentation with 2 pumpovers / day. 20 months in 40% new French oak. 6.8 g/L TA, pH 3.54, 14.5% ABV. $130 / bottle RRP. 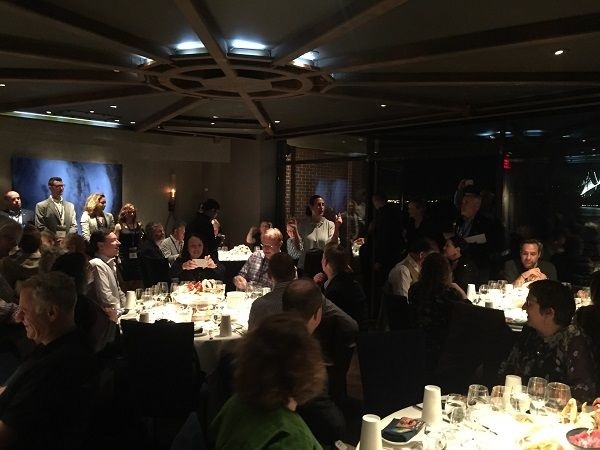 Though the official California Wine Institute-organised trip concluded over hotel breakfast, IMW North America organised a couple of extra events on the Saturday afternoon and evening, for any MWs still around. Students and other interested folks joined us for the afternoon session. This was a panel discussion on the future of Napa Merlot, with tasting of wines from the panel attendees. 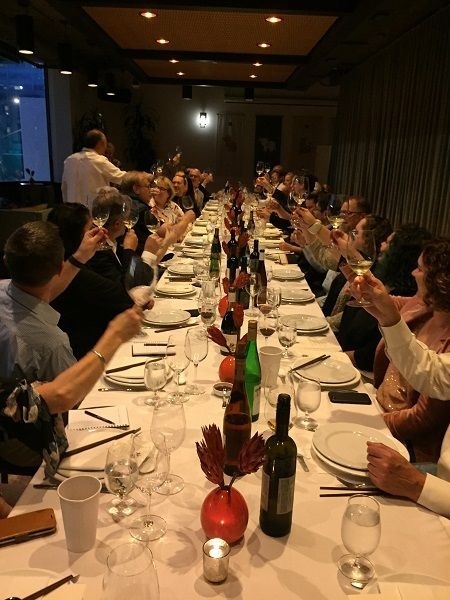 It was led by Tim Marson MW and Mary Margaret McCamic MW, with Nova Cadamatre MW (Robert Mondavi), Ivo Jeramaz (Grgich Hills), Neil Bernardi (VP Winemaking at Duckhorn) and Aaron Pott (Pott wines and consultant for wineries including Blackbird Vineyards). The subject of Merlot and its future in California, is a fascinating one, given the hit in reputation that the variety took from Sideways. The previous year, the IMW North America looked at Cabernet Sauvignon, so it was appropriate to review where Merlot is and where it is going. Tim gave some background: OIV stats make Merlot the 4th most planted of all grapes and 2nd of wine grapes Globally, representing 3% of world production. It is 4th in Chile and Australia, notable in Italy and South Africa, and is 4% of US plantings, being the 6th most planted variety. 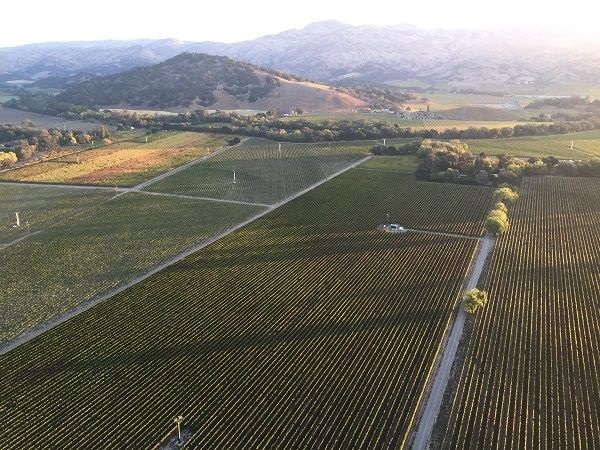 For California, 39,786 acres were planted in 2017, with Merlot representing 12.3% of Napa County at 4,881 acres, slightly below 2016’s figures. In crush volume terms, 6% of California was Merlot, slightly behind 6.2% for Pinot Noir. Surprisingly, there is actually more Merlot planted today than at the time of the Sideways movie. 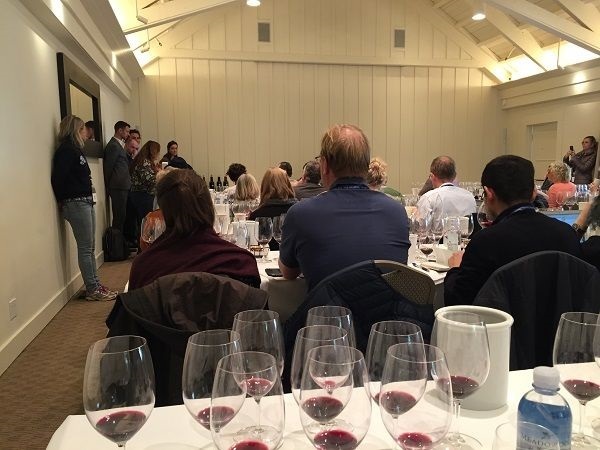 Mary Margaret introduced the topic, referencing the quality of Screaming Eagle’s The Flight as an example of what Merlot can do in Napa, and reminding the audience that US consumer and winemaker perspectives of the grape may not be indicative of a Global consensus of attitudes. 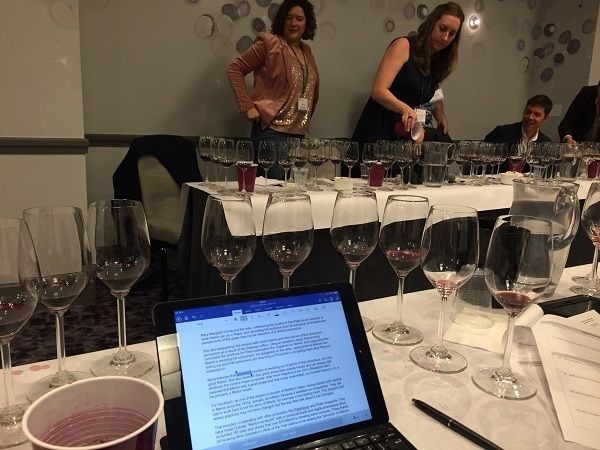 She also wrapped-up the session with observations and discussions of that consumer perception resulting from Sideways, citing an academic study that recently concluded the positives for Pinot outweighed the negatives for Merlot, and suggesting that Merlot is declining for consumers. Ivo disagreed on the latter, saying that his Merlots are selling out and that consumers are now tiring of Pinot that is not giving them what they are interested in. Nova believes that Sideways resulted at weeding-out of plenty of the ubiquitous, not very good Merlot. She also believes that great wines step outside trends and can always sell, whatever the current mass-consumer style trend happens to be. Aaron’s Blackbird client believed that Merlot was a good grape and that it was underrated, so invested heavily in it, to be primarily a Merlot estate. For Duckhorn, as one of the largest producers of Merlot in Napa, having started with varietal in Merlot since the 1970s, they actually benefitted, because the Sideways effect weeded out competitors. Nevertheless, to deliver that, they still had to work hard to tell the story of Merlot, for example in their tasting room. Their vineyard and winery practices may not have changed, but the way they talk about it has changed. That includes co-operating with other producers, like Pahlmeyer and Pride Vineyards. Together, they made October “Merlot-me Month” with a combined trade and digital promotional drive, co-funded. In terms of outcomes, recent IRI data shows that Merlot over $15 a bottle is showing some success. Duckhorn’s Three Palms 2014 was named Wine Spectator’s Wine of the Year, which seems to be bringing Merlot ‘full-circle’, back to respectability, and their core, Napa Valley Merlot has grown 38%. What do you love about Merlot? What is most challenging? Ivo explained that Merlot’s challenge is being more difficult to grow than Cabernet, due to a tendency to raisin. Grgich Hills has some Merlot near Dominus – who pulled Merlot out because it raisined without irrigation – but Grgich use 20 gallons a year just to prevent raisining, rather than to irrigate the plant per se. They also ensure canopy shading to prevent berry heat that cooks fruit and reduces sugar accumulation. American Canyon in Carneros provides 80% of their Merlot, and 20% from Yountville. Merlot brings acidity that can be pH 3.35 at picking with 24-25°Brix. Nova believes it needs a much cooler site than Cabernet, with some difference in soils – some gravel and not too heavy. In a bad site, its profile becomes ugly, and because it is a much lower price per ton than Cabernet Sauvignon – around $3,400 vs. Cabernet at $7,500 – it is often planted in poor sites. Further, growers have little incentive to invest in it in the vineyard, and indeed, to keep it planted at all. For her, the beauty of Merlot is that it can bring subtlety and beautiful texture to a blend, so is and will continue to be important. Aaron spent time as winemaker in Troplong Mondot, and his view on its biggest challenge is poor flowering as a result of berry shatter in any challenging weather – much like Pinot Noir – though not as terroir sensitive as Cabernet Franc. Merlot needs good humidity, which is relatively rare in Napa, so where redwood trees are found, holding humidity, tends to help, as well as foggy Carneros. It has big leaves and relatively close leaf nodes, which keeps the humidity up around the plant itself. Neil’s Duckhorn estate focused on Merlot initially because it was plusher and more approachable than other varieties available in the 1970s. Heat-sensitivity is the major issue for him, with a narrower band of perfection at the point of harvest, meaning trellising, irrigation and other vineyard choices are more critical than for Cabernet Sauvignon. How does Merlot work with other varieties and how do you select wines for blend base? Ivo explained that 100% Merlot works for them to give personality over ‘prettiness’, so didn’t blend in other varieties to fill-in gaps and make it look better. Temperature is controlled to under 80°F, because higher temperatures leave bitter tannins, and skin maceration is shorter than Cabernet. In blending, Merlot is used just if it happens to add something. Nova also maximises fermentations at 85°F, whereas Cabernet Sauvignon will be 3-5°F higher. Merlot tannins tend to be more astringent and coarse, so tannin handling is very important. Open top fermenters can be used if 0.5-1% ABV needs to be evaporated away, otherwise water addition can ameliorate high Brix at harvest. Aaron explained that acidity is less critical for Merlot ageing than tannic structure – pointing out a 4.01 pH of 1947 Cheval Blanc. While he handles the grapes gently into the vat, he then punches down several times a day, and uses extended skin macerations to make sure that the tannins in the finished wines have the perfect, velvet tannins and doesn’t drain the tank until that point – up to 50 days total skin contact. That’s especially true for his Howell Mountain estate. Neil echoed the importance of Merlot tannins. To achieve that, hand harvesting and sorting is followed by gentle destemming with a high-tech destemmer, then 24 hour cold-soak and 82°F maximum temperature fermentation (vs. 85-87°F on Cabernet). 12-14 day fermentations and maceration is the total. Ivo discussed clonal experimentations, but said he doesn’t intend to uproot as they plant for 50-100 years, with 2 clones planted – mostly Clone 3. Nova explained that Schweitzer vineyard’s clone is unknown, planted on St George and 101-14. Some of To Kalon is being replanted and Nova has asked for some to be Merlot, by Highway 29. There isn’t much new genetic material available, as nurseries are focusing on cleaning out red blotch and other viruses. Aaron explained that material has come from Europe but often failed due to viruses, and he uses the Three Palms clone. Duckhorn prefer 181 and 3, for smaller berries and shrivel resistance. Can higher yields be used to mitigate alcohol? Joel Butler MW challenged the panel on this and Mary Margaret questioned whether reaction to climate change is part of the move to freshness. Ivo explained that 2018 is a case in point, where yields were high and quality good too, coming in with good malic acid at 25-26°Brix ripeness. Nova also experienced the same, but believes the acidities are not a function of yield, but just a cooler growing season. For her, 5t / acre is possible but over that, phenolic ripeness becomes difficult, and it is highly site-specific. Where else could be good for Merlot? Aaron discussed the switch from Pinot to Merlot in Carneros and some other cooler Napa zones, but unfortunately, Sideways has pushed Merlot away from being a grape to be explored and planted. Neil and Nova both believe Washington State’s cooler zones are interesting, with Nova also citing New York State for cool places. Ivo believes that tight grained oak is better to avoid tannin donation and only around 40% new oak, but this is the same for their Cabernet. They are exploring Hungarian oak and may seek out some alternative European sources. Either way, oak is only a spicing for their house style, so is relatively low-influence across the board. Nova uses only French oak, but the Napa Merlot is only 3% new (40% on the blend and 80% on Cabernet), with tight grain also important. Demptos or Boutes oak are not tight enough, so Sylvain, Taransaud and others are preferred. Less new with Merlot is important. Aaron explained that in St Emilion, in the 1980s, barrels specific for Merlot were explored in-depth and spawned a group of Right Bank coopers making fine, Merlot-ready barrels, like Sylvain. Western French forests, which are more humid and more aromatic, with extremely tight grain, provide the wood these coopers are using. Lower toast, with long drying is also important. Duckhorn mostly use French oak, but with some ‘spice-rack’ experimentation with Hungarian. They have a range of coopers, but over time, are whittling down the right coopers for each block and vineyard, to have oak that supports and complements, rather than dominating vineyard character. What makes an ageworthy wine and how does Merlot do that, and is ageability important for you? Ivo looks for structured tannins for ageability, including some seed tannins especially, so avoids delestage that removes seeds. Ripe seeds are therefore crucial. Grgich Hills do look for ageability, but consumers are much less tolerant today of holding, though that may be swinging back now. Nova looks for the interplay between acidity and tannins, as too much acidity can make tannins feel short and harsh. Getting the right balance is important for ageability. Mondavi have multiple styles, since different consumers are looking for different things. 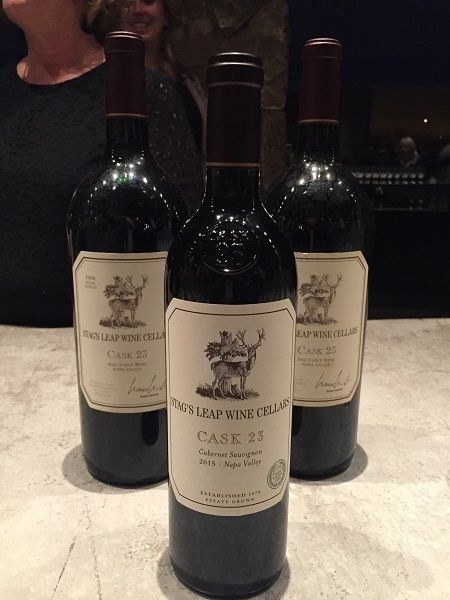 The Estate Cabernet is designed for drinking immediately at purchase, but can hold for up to 5 years, while the Momentum 2013 blend is more ageable and intended to appeal to consumers interested in that. Aaron targets ageworthiness, as that his the style he personally likes. Tannic structure is the most important, with plenty of quantity of tannins, but also resolution and finesse of the texture of those tannins, for example through extended macerations. Some of Bordeaux’s greatest vintages are low acidity. But they have tannins. Pinot is different – with a different overall structure – that needs acidity. He also thinks that higher-yield wines tend not to deliver the right structure. For Neil, ageability is important, but bearing in mind that the vast majority of wines are drunk within 24 hours, so being pleasing to consumers immediately is important. Up the price-bracket, being able to stand the test of time matters more, so Three Palms is designed to be more ageworthy, whilst Decoy is much less so. Stout Vineyard also is ageworthy, and that reflects the importance of site to ageworthiness. 100% Merlot, in cooler zones, gives a more Cabernet. Clay, humid soils at American Canyon, planted 25 years ago on AxR1 then interplanted with resistant rootstocks, but the plants on AxR1 are still OK. Cooler vintage than higher-rated 2007, but he believes it is ageing better. 100% Merlot. Great vintage for Cabernet and pretty good for Merlot. Carneros, Oak Knoll and Stag’s Leap fruit to keep fresh acidity. N: Compote plum and blackberry. Broad and plush with plenty of fruit ripeness. Subtle tobacco and camphor oak. 66% Stag’s Leap single vineyard Schweitzer vineyard Merlot on pumice volcanics, giving more structure and ‘crunchy’ tannins. Cabernet to fill out the blend. Blend of all 5 Bordeaux varieties, where Merlot fills the mid-palate gap. Well-drained clay over loam. To be released in 2019. 23 different vineyards from Howell Mountain to Carneros to Calistoga, with a skew to southern Napa for red fruit, but with Three Palms as a significant proportion. 85% Merlot, 12% Cabernet Sauvignon, 2% Cabernet Franc and 1% Petit Verdot. Surprisingly warm site but which gives good structure. Acquired outright in 2015. 91% Merlot, 5% Cabernet Franc, 4% Cabernet Sauvignon, 1% Petit Verdot. $98 / bottle. 100% Merlot from cool, Hyde and Hudson vineyards in Carneros. Doug Frost MS MW and Mark de Vere MW organised this in a new venture from Chinese chef George Chen, in the less fashionable Chinatown district of San Francisco. George himself came to see us and cooked. The food was excellent and it was accompanied by a plethora of eclectic wines brought mainly by the North American MWs present, including many from unusual states like Iowa and Nebraska, courtesy of Doug. I carried over several extra Duckhorn Merlots from the earlier tasting. Several of these were misses (20+ year aged Norton anyone? ), but instructive nevertheless. Some less usual varieties and / or origins were hits though. Amphora was a nicely-textured, albeit ‘natural’ funky wine, with the wine and the amphorae apparently made by the owner. There was an interesting Petit Manseng South River Vineyard from Virginia. But a particularly convincing star was Hartford’s 2016 Jurassic Vineyard Chenin Blanc from Santa Ynez, reinforcing from Day 1 that this vineyard can produce quality Chenin. 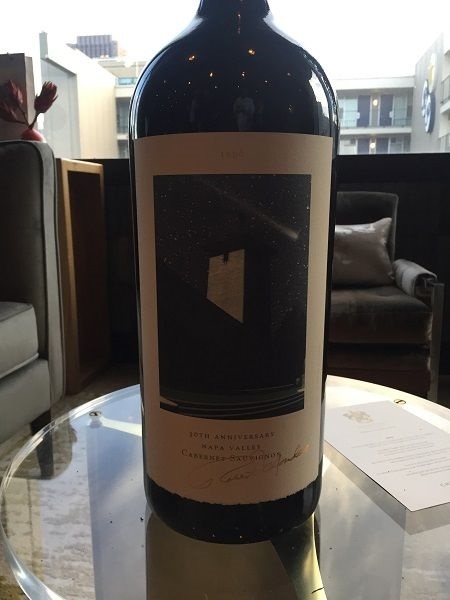 In his leadership role at Robert Mondavi, Mark supplied a 5L Impériale of Mondavi’s 30th Anniversary special edition Cabernet Sauvignon Reserve 1996 which was both generous and very fine. Their straight Napa Cabernet Sauvignon from the unfancied 1972 vintage showed surprisingly well, if on its way down; a pleasure to taste such history. Amongst the other wines, with a chilli-prawn dish, I hoped a Riesling Spatlese might be amongst the wines available; sure enough someone had brought a Dr Loosen Wehlener Sonnenuhr Spatlese 2015 and the match was faultless. It was matched by another Riesling Spatlese – Leitz Rudesheimer Magdelenenkreutz 2009 from the Rheingau. On the Riesling theme, the 2008 vintage of Trimbach Cuvée Frederic Emile is drinking very well now. John Hoskins MW had a well-matured J. L. Chave Hermitage Blanc 2007 which, though perhaps not with the finesse of finer years from Chave, was a fascinating, mature Marsanne-Roussanne, with buttered macadamia-nut richness and some salinity to give freshness to its otherwise fat frame. Made by a potter, who also made the amphorae used for fermentation and maturation. Made by Nova Cadamatre MW. Made by Nova Cadamatre MW. Just bottled, so no label. 5L Imperiale. Only the best plots of To Kalon.